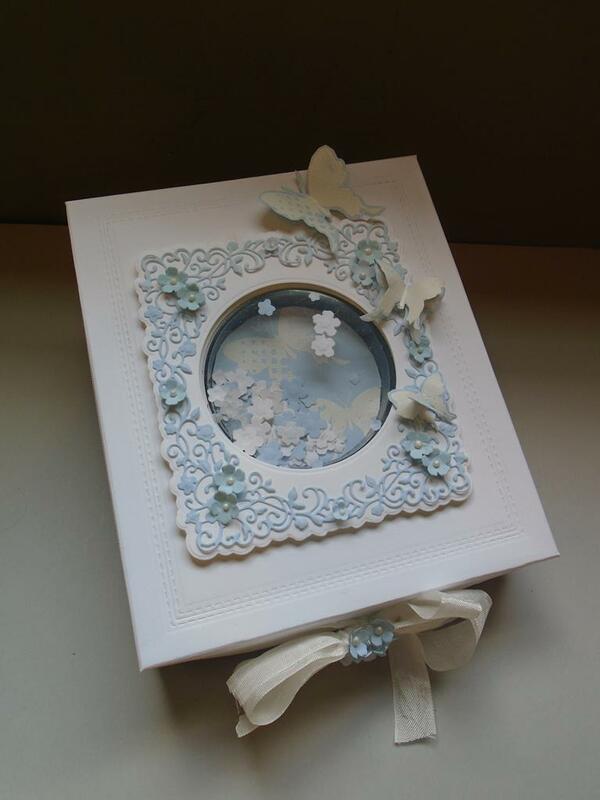 This project will show you how to make this Sue Wilson delicate garden frame sunken shaker box using the Creative Expressions Lisa Horton NEW stamps along with the Sue Wilson Shadow Box Collection ~ stitched lattice frame and the Delicate Garden Frame Die. 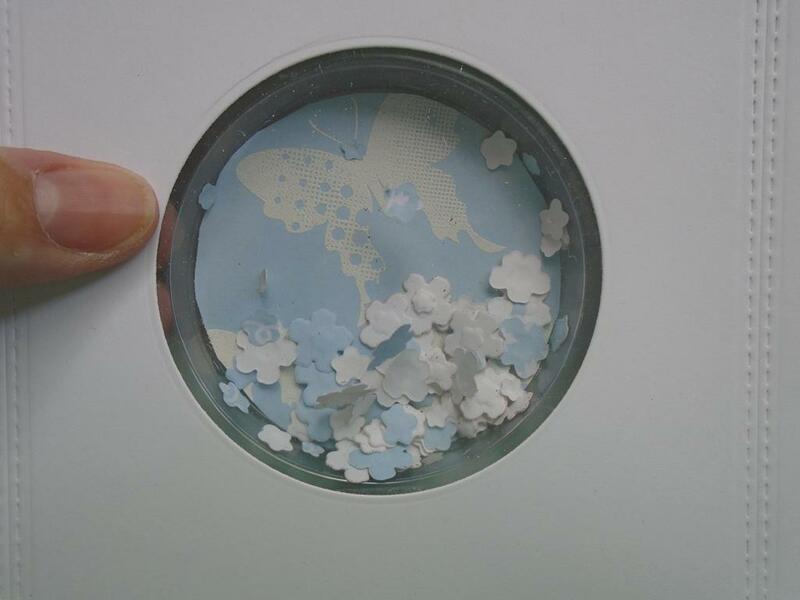 The butterflies have been stamped and embossed in white on some baby blue card and sunk into a Creative Expressions Treat Cup. 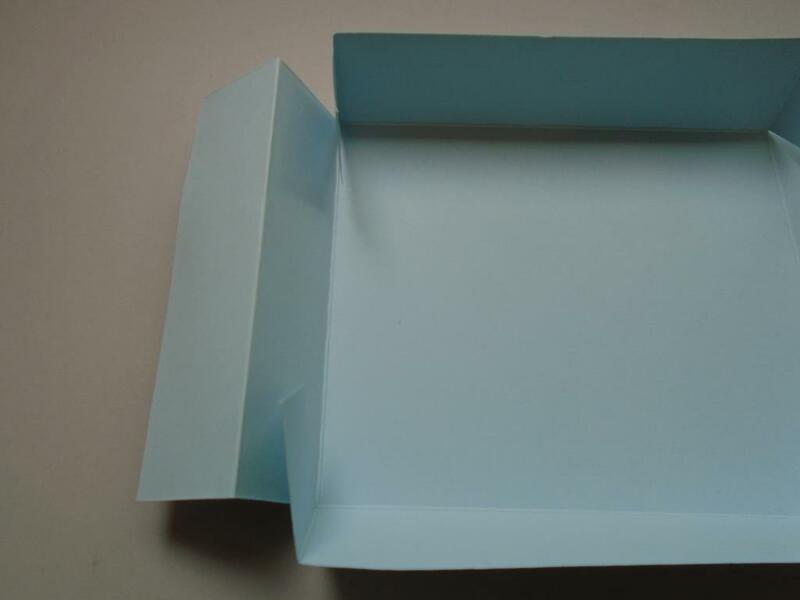 The project will show how to invert the treat cup to give the sunken effect in the lid of the box. 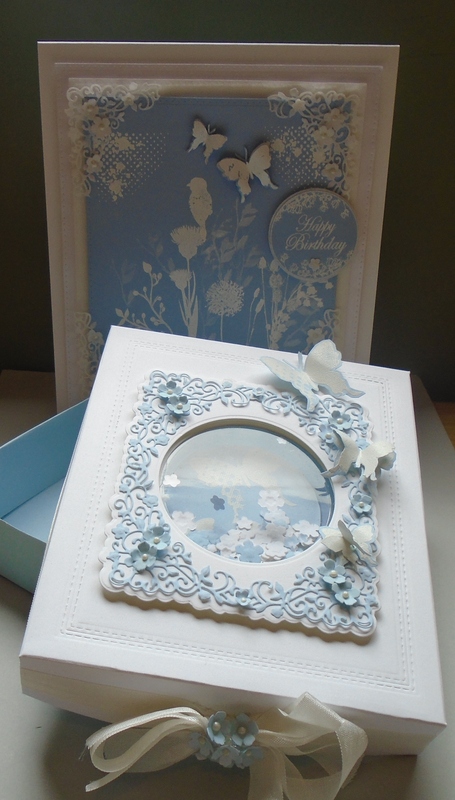 The box compliments the delicate garden frame card that was made in another project which can be found on the Creative Expression weekly workshop blog. Step 1. This workshop will show you how to make this sunken shaker lid box using these main products. The Sue Wilson shadow collection ~ stitched lattice frame die set, the tags & frames delicate garden frame die set and the festive collection cottage snow globe scene die set, although any of the snow globe scene dies will work. 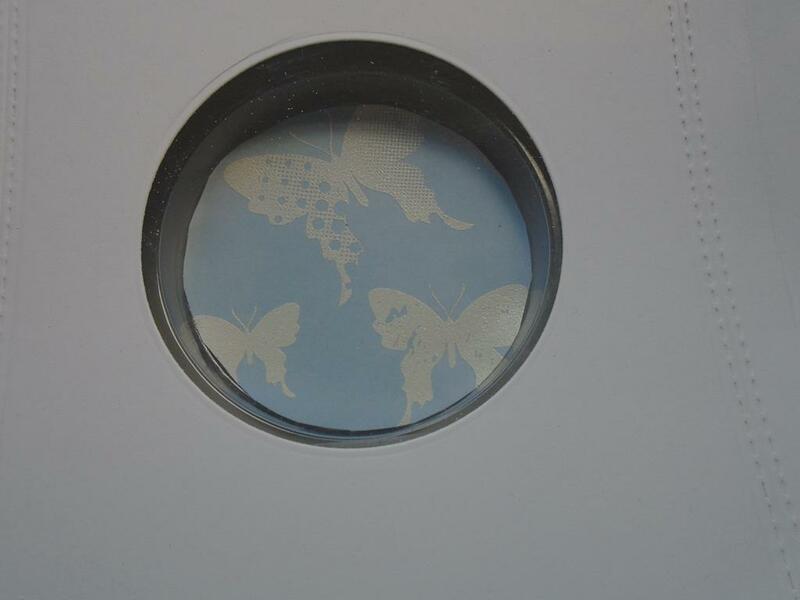 The Creative Expressions butterfly splash stamp set adds the dimensional element when the butterflies are cut out and a Creative Expressions treat cup is used for the sunken element of the lid. A full list is found on the front page of the project. Step 2. 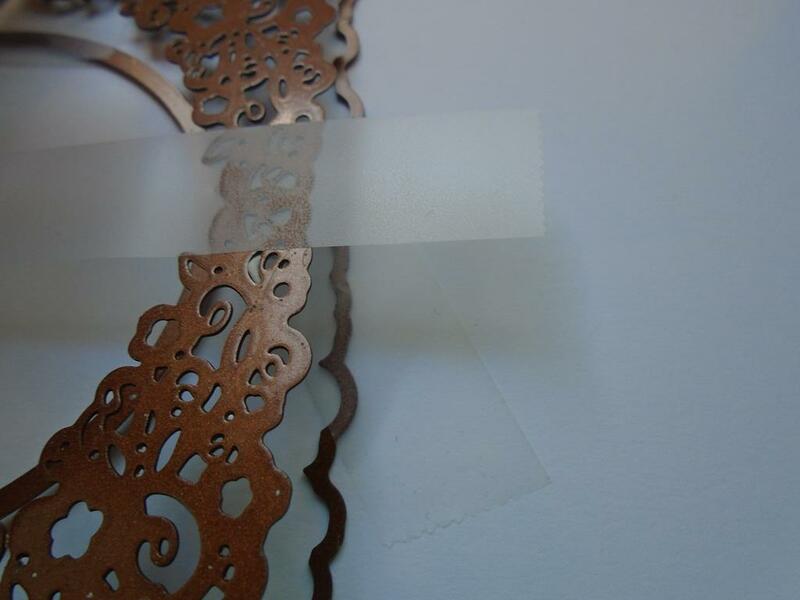 Place a long strip of the low tack tape across the width of the solid outer and the intricate frame from the Sue Wilson tags & frames delicate garden frame die set. Step 3. 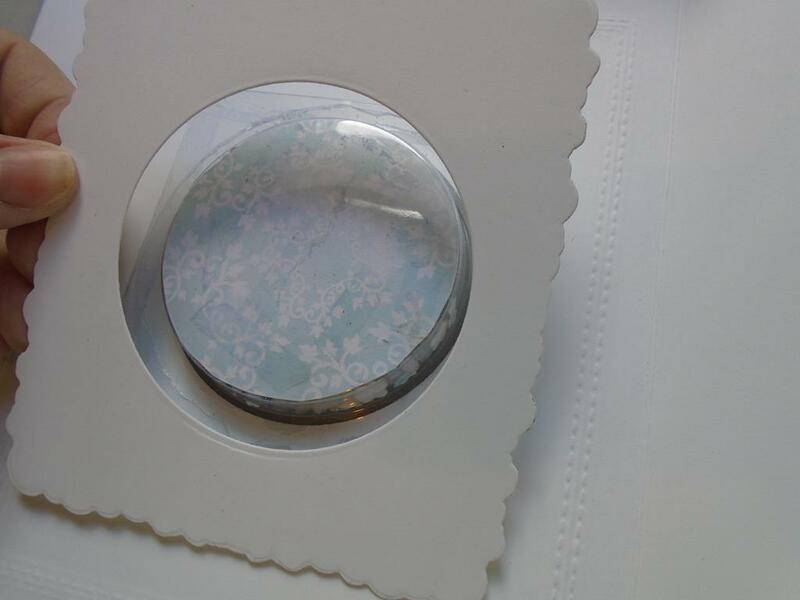 Tape the circle die from the Sue Wilson snow globe scene die set onto a piece of Foundations coconut card. Step 4. 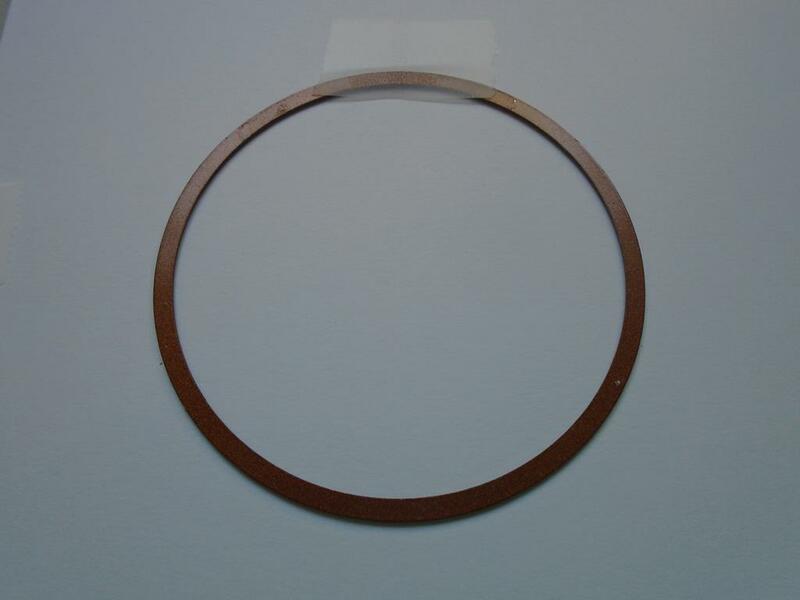 Lift the joined 2 delicate frames with the low tack tape on and lay them over the circle die. Step 5. 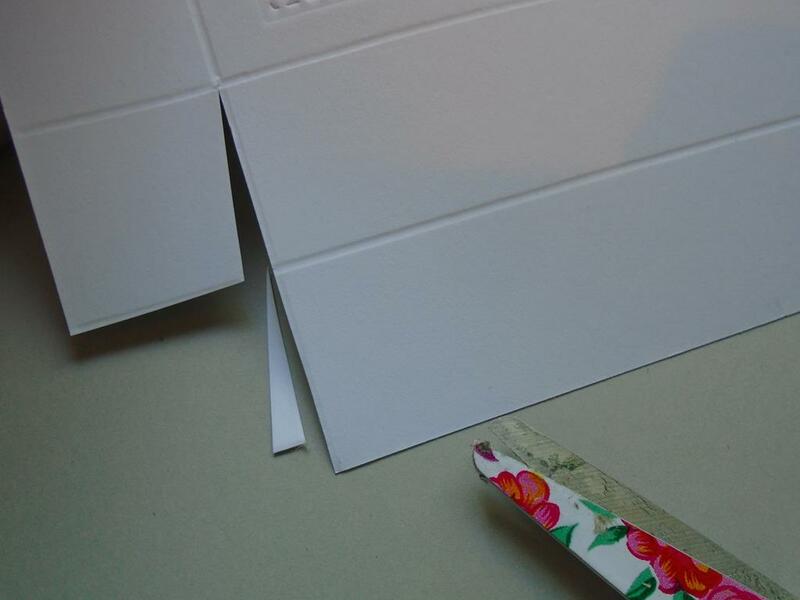 Lift the right hand side edge of JUST the intricate section and place another piece of low tack tape to secure the solid outer edge die onto the card. The left hand side of the die is still attached to act as a hinge whilst the tape is laid down. Step 6. 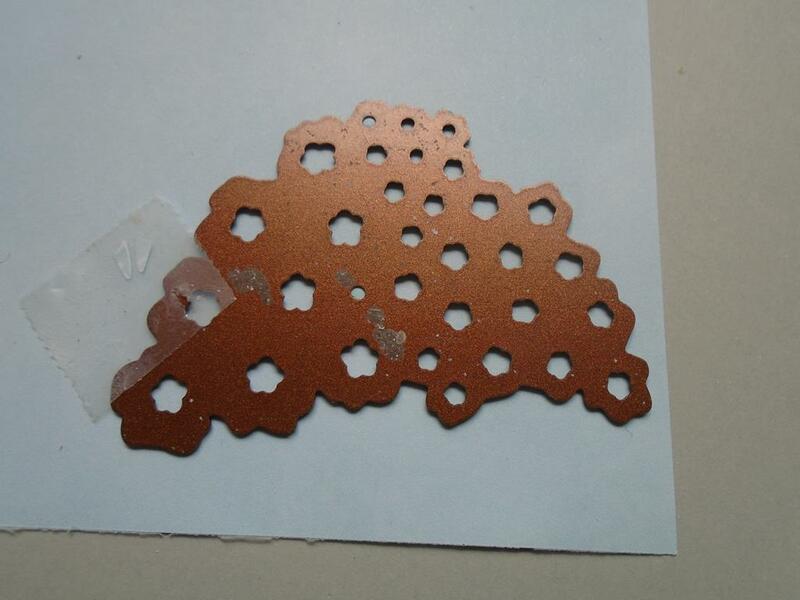 Remove the intricate die and add another piece of low tack tape on the left hand side of the dies. 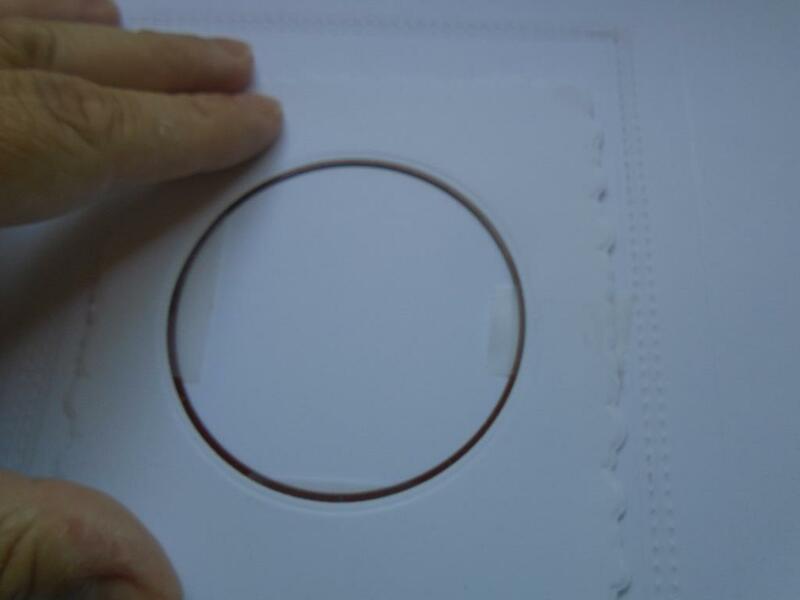 This is done to make sure the circle is central in the card as there will be little space once a stitched frame is added to the box lid. Step 7. 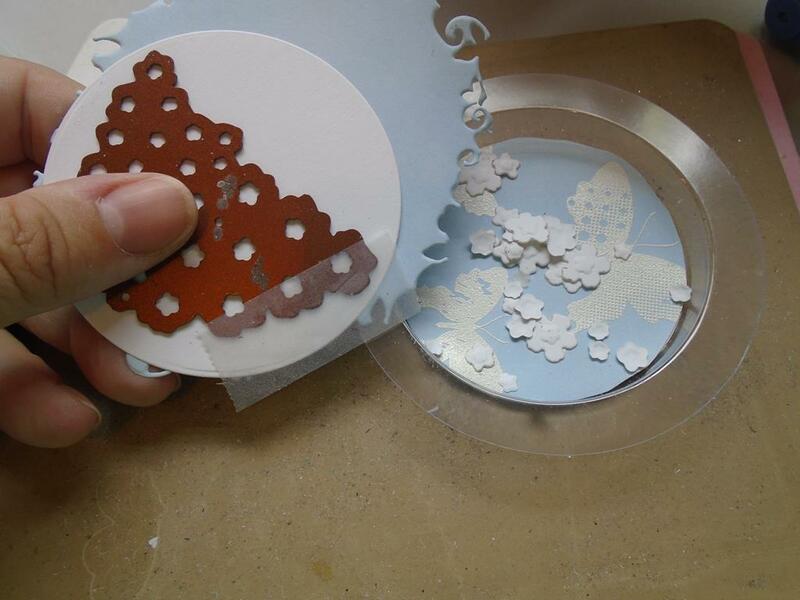 Run the prepared piece through the Grand Calibur to cut the piece and then emboss the die shapes afterwards. Step 8. Place a sheet of A4 Foundations coconut card in a landscape position on the worktop and find the exact centre of the long length and width of the card. Mark this with a pencil. 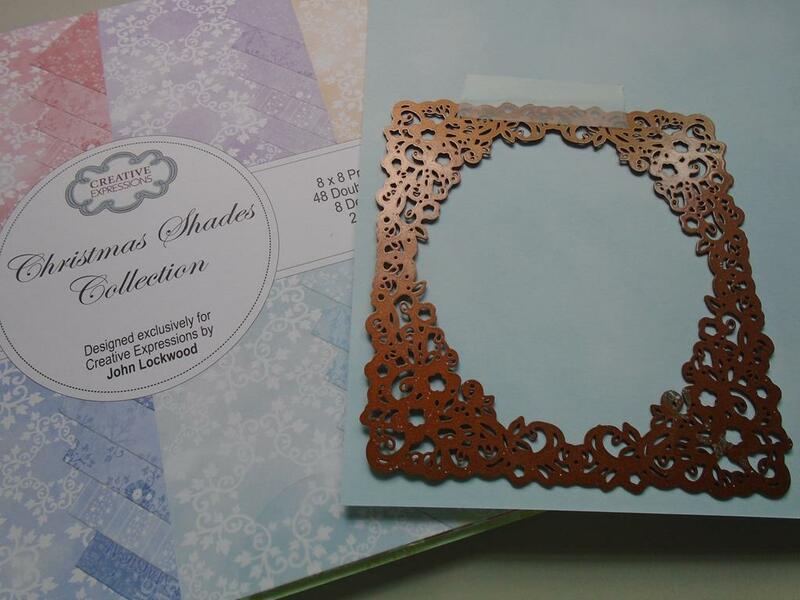 Also find the centre of the Sue Wilson shadow collection ~ 2nd from largest stitched lattice frame die on the width and length of the die. I marked mine with a permanent pen as it can be removed with alcohol remover later if needs be. Step 9. Place the marked die in place using the marker points and pencils marks on the card to marry the die up. Secure the die in place with some low tack tape. 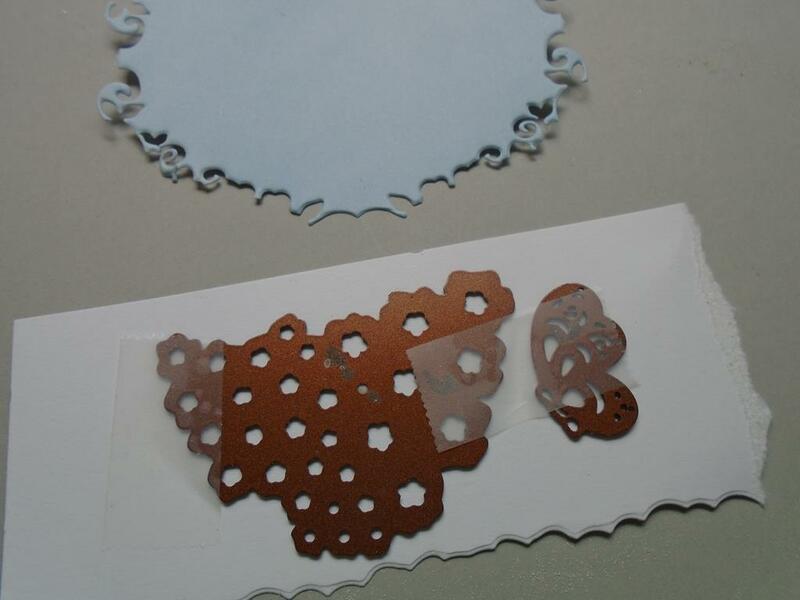 Now run the prepared piece through the Grand Calibur using just the embossing pink plate, tan mat and base plate as you don`t want the card to be cut at all. Step 10. 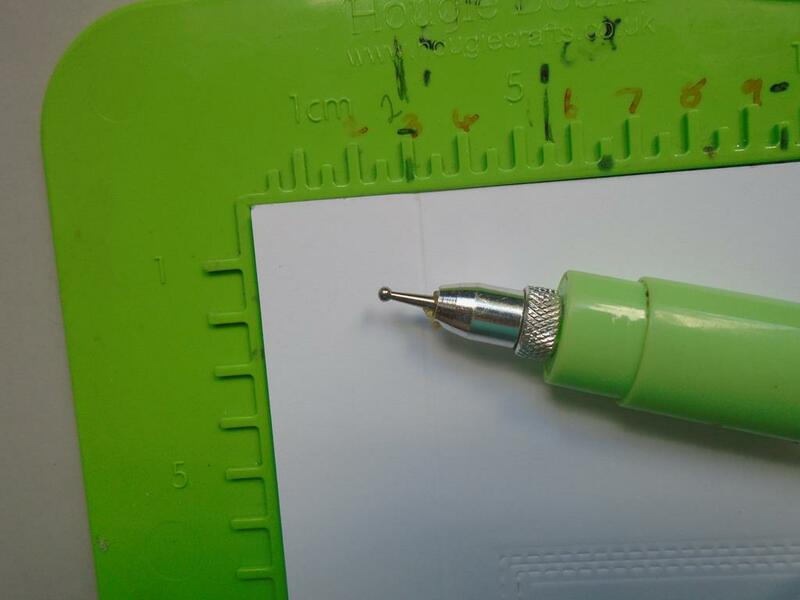 Erase the pencil marks made when finding the centre of the card. Step 11. 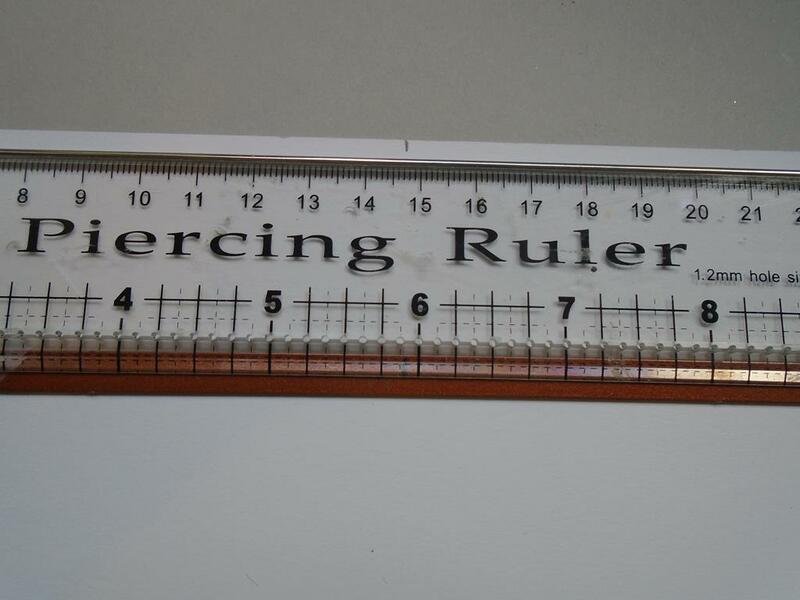 These measurements are important as the frame and then scoring is needed so no card will be trimmed off afterwards. 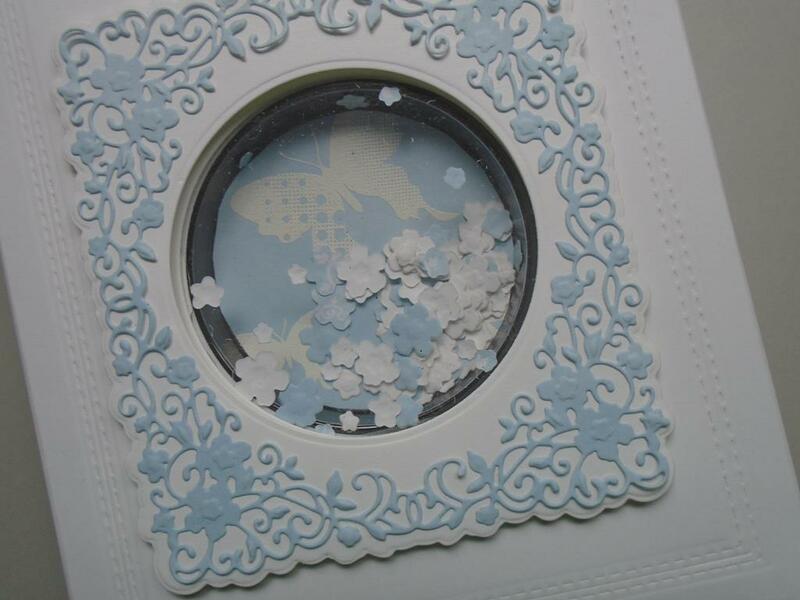 Here is the embossed stitched frame effect on the card. Step 12. 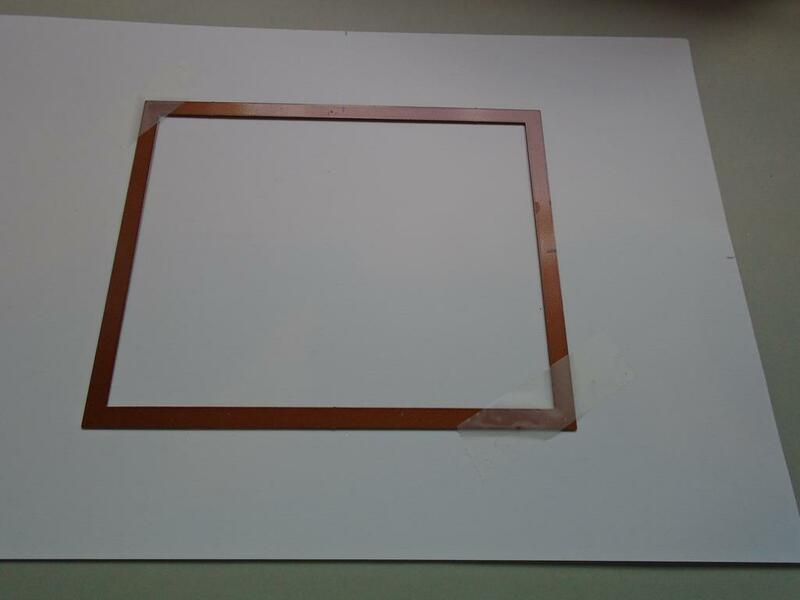 Place the worked piece on a score board in a portrait position and score down the long length at 3cms. 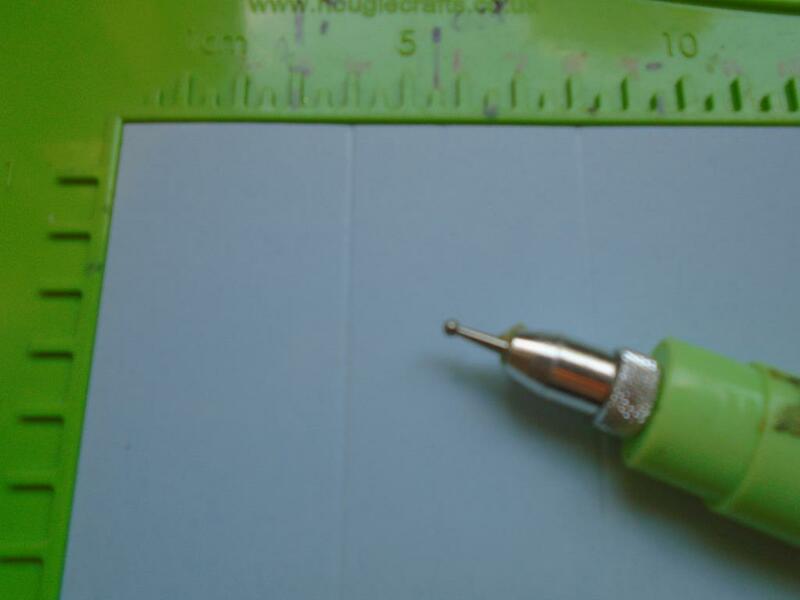 Turn the card 180 degrees to the opposite side and repeat the same 3cm measurement. Step 13. 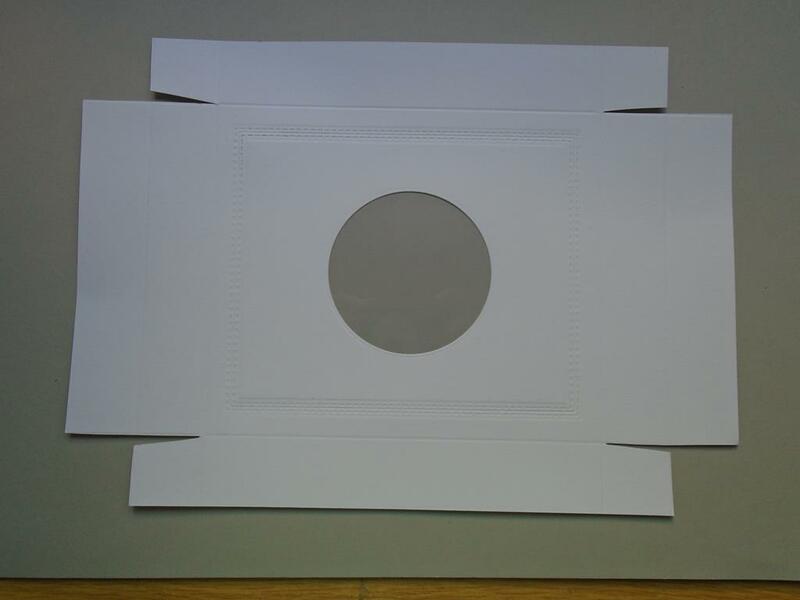 Turn the card to a landscape position and score the end at 3cms and 6cms. Again turn the card to the opposite end and repeat the 3cms and 6cms measurement. Keep the lid flat when working on the next few steps. Step 14. 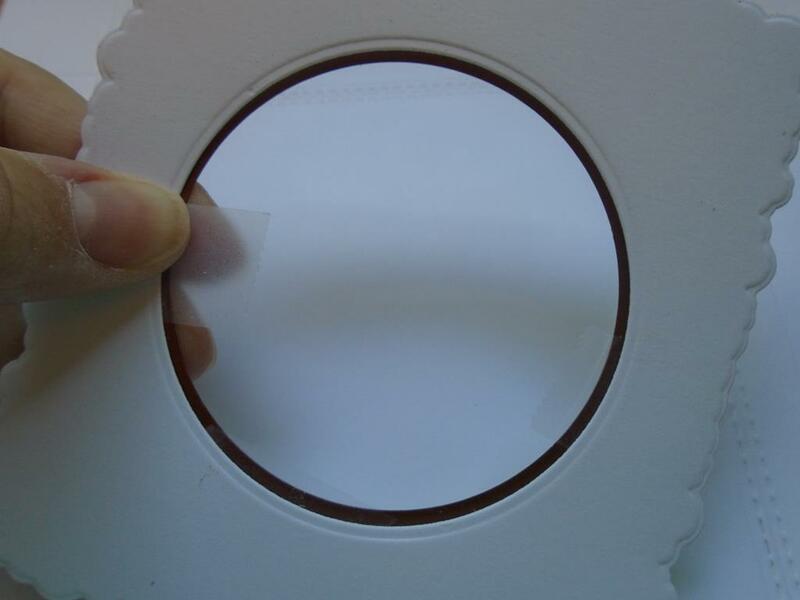 Place the circle die with some low tack tape prepared on the top of the die behind the circle aperture so it marries up with the hole in the die cut panel. Step 15. 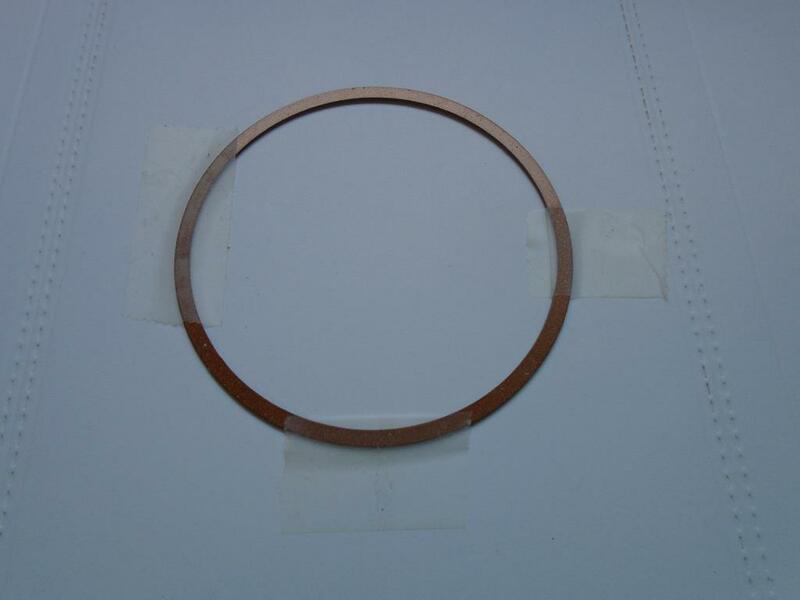 Lay the panel in the middle area of the stitched area of the lid and press the die / low tack tape in position. Step 16. This will ensure the die / sunken treat cup will be in exactly the correct position when it`s added later on. Run the die and card through the Grand Calibur making sure none of the edges of the card fall outside of the cutting plates. Step 17. 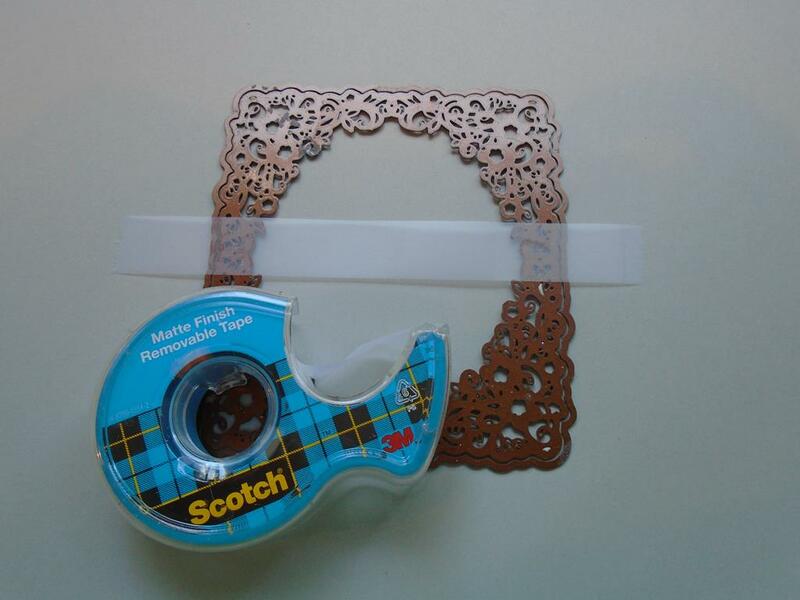 Use the adhesive eraser to remove any sticky marks the low tack tape has left behind. Step 18. 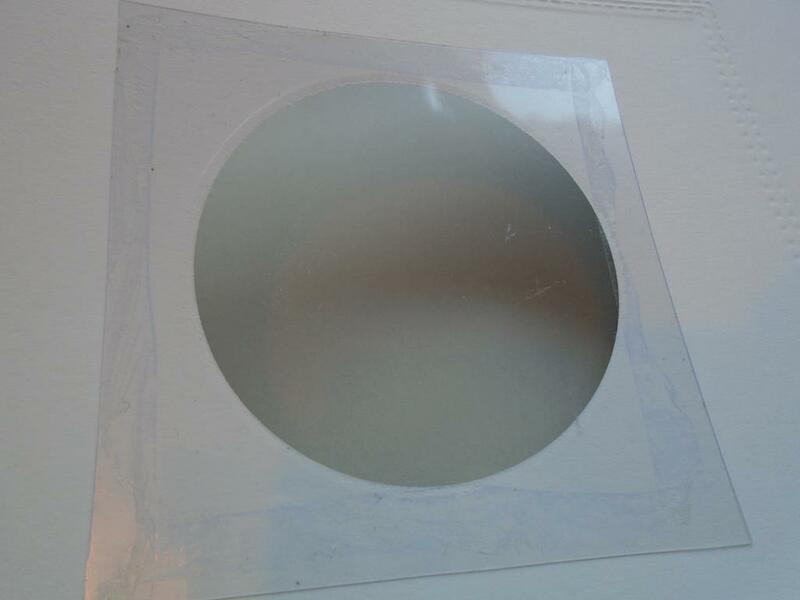 Add a square of acetate so it just covers over the reverse of the aperture and use a tape runner or dries clear glue to hold the panel in place. Step 19. Trim off the bottom 3cm square on the lid. Step 20. Cut a straight line up to the 2nd scoreline before cutting a diagonal line up to the same point to make the tab notch. Step 21. 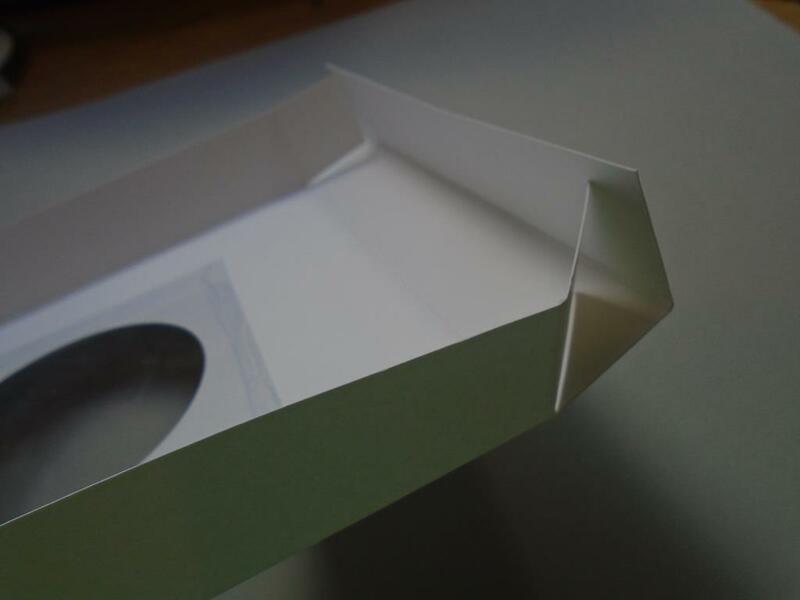 Repeat this on all of the other corners to create the basic lid shape with the ends which will cover the tabs in the ends of the box. Step 22. Crease over all of the scored lines and corner tabs. Step 23. Lay but DO NOT stick the Creative Expressions treat cup over the acetate / aperture so you can see how it will look at the end. Step 24. 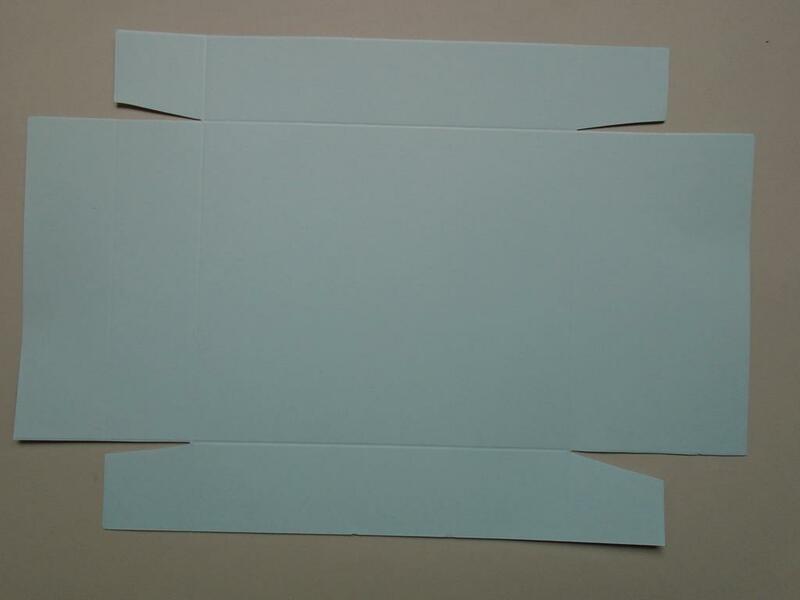 Select a solid blue / colour cloud effect sheet from the Creative Expressions John Lockwood Christmas shades 8″ x 8“ collection paper pad. 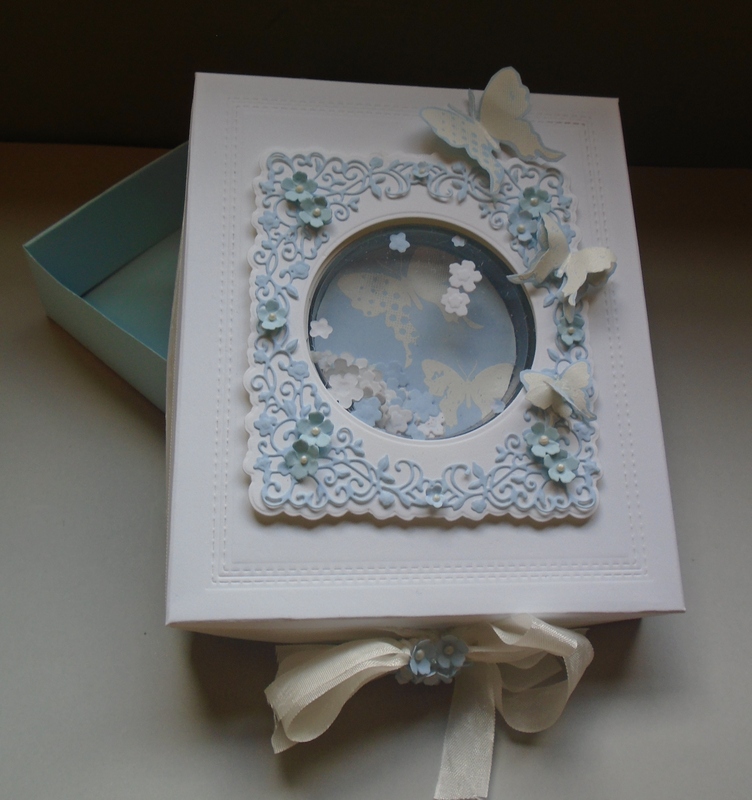 Place the intricate tags & frames delicate garden frame die set onto the paper and secure in place with some low tack tape. Step 25. 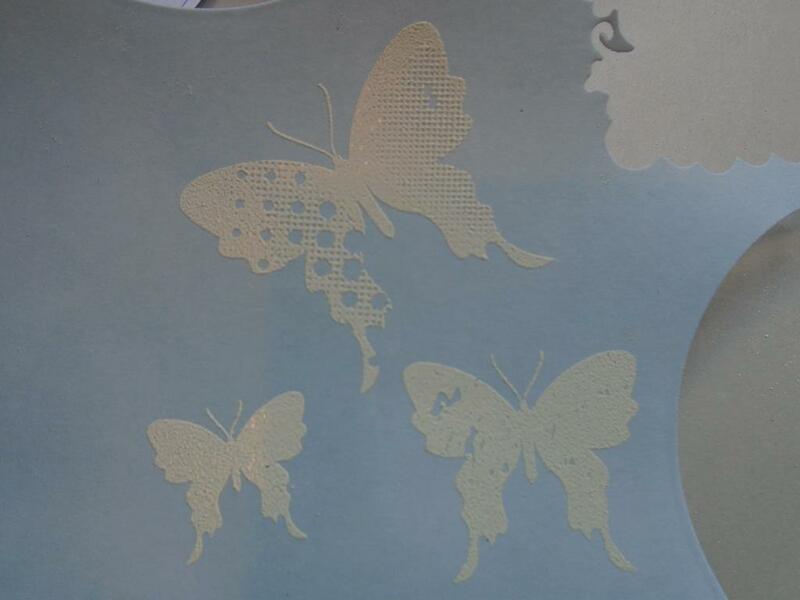 Run the die through the Grand Calibur to cut it and then emboss it using the embossing plates etc. Step 26. 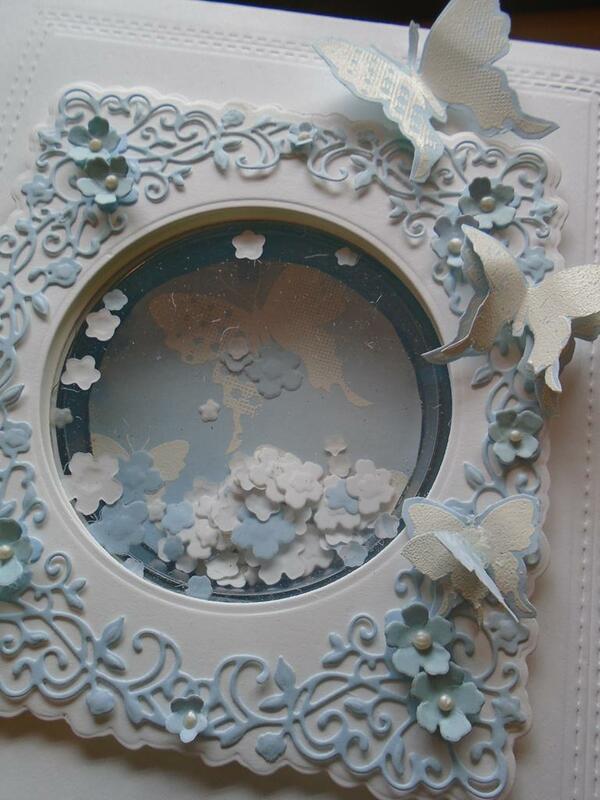 Use some Cosmic Shimmer dries clear glue to attach the frame onto the solid white frame that was created earlier on. Step 27. 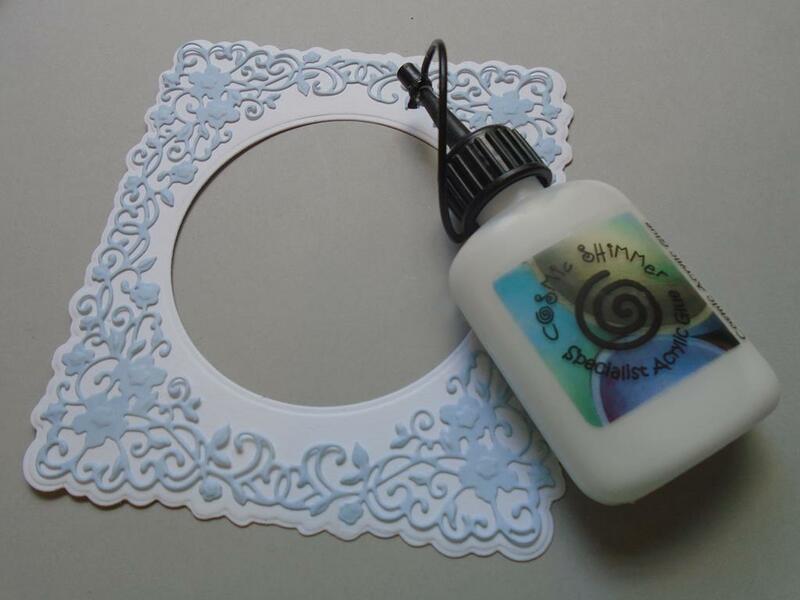 Cut a matching colour blue circle using the snow globe die and then lay 3 butterflies from the Creative Expressions butterfly splash stamp set. 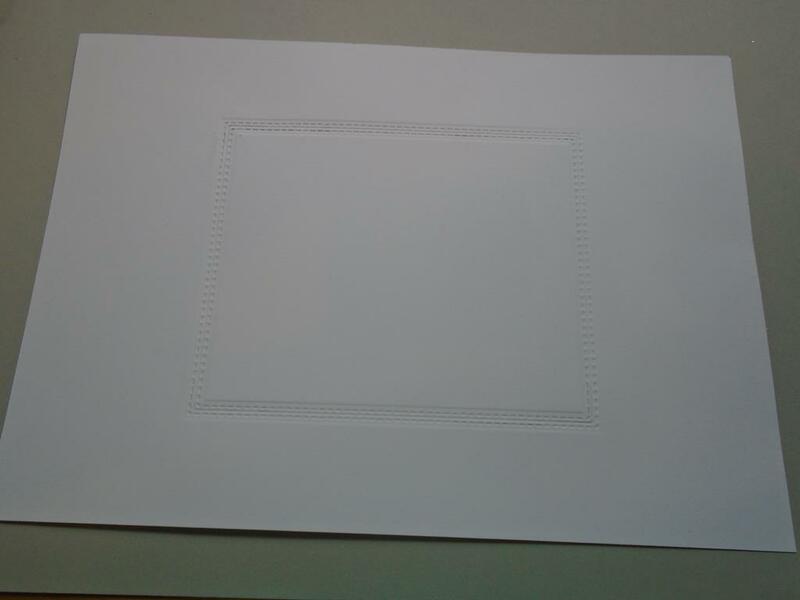 Make sure they are facing down onto the paper so the flat sides of the stamp are facing upwards. Step 28. 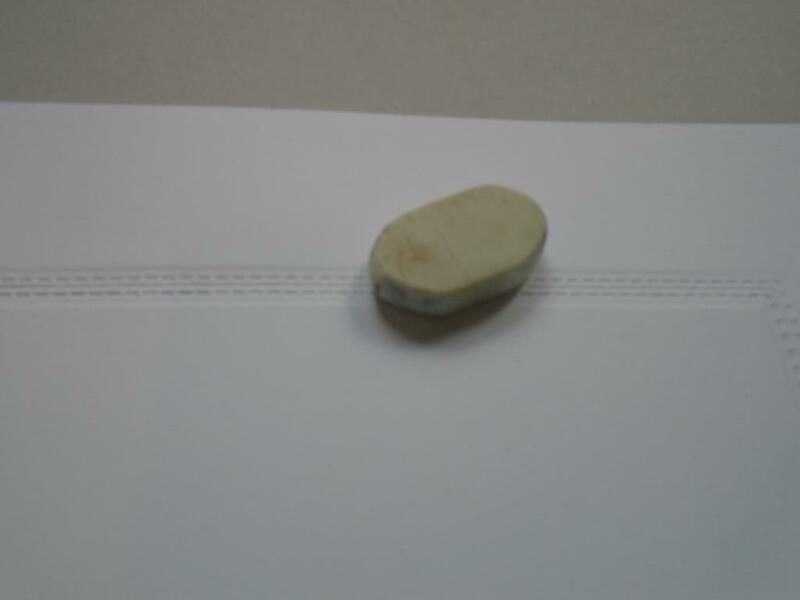 Press an acrylic block over the stamps to pick them all up in the correct position to be stamped onto the paper. Step 29. 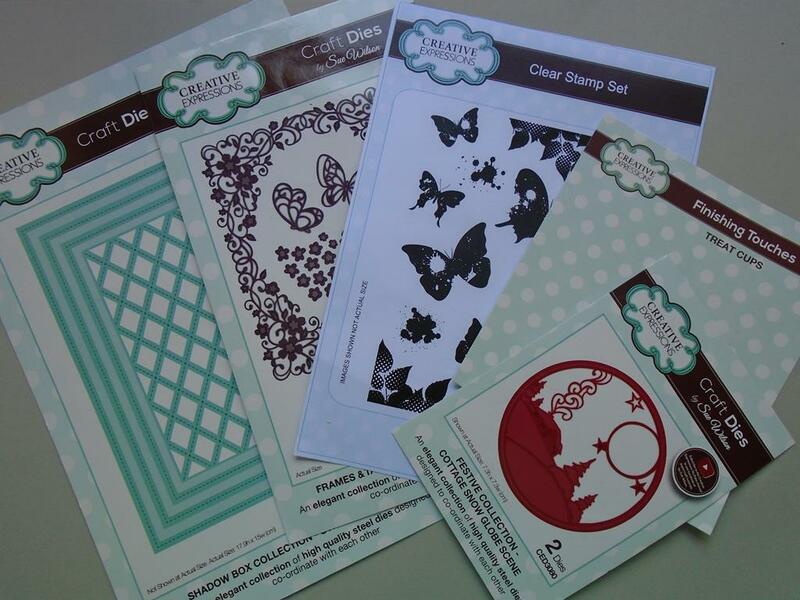 Use a Perfect Medium ink pad to ink up the butterfly stamps. Step 30. 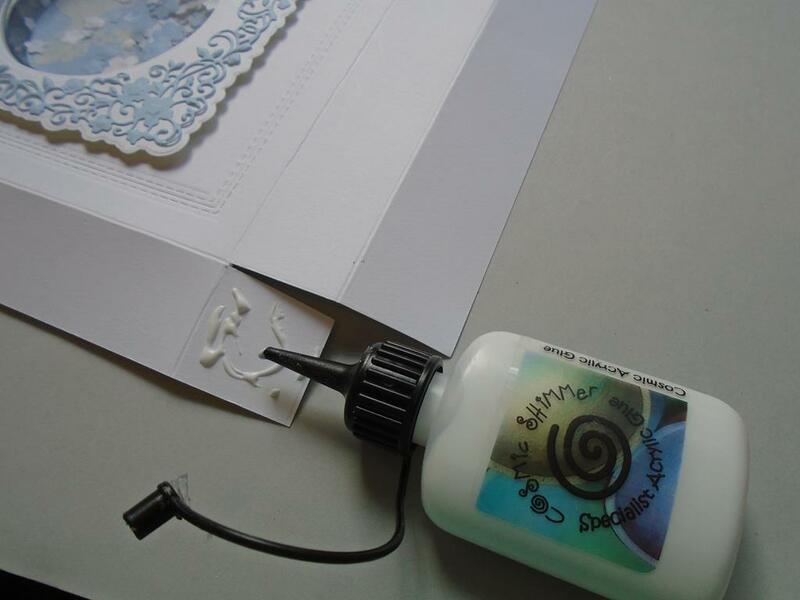 Stamp the image onto the blue paper and then use the Cosmic Shimmer pure white embossing powder to pour over the top of the ink. 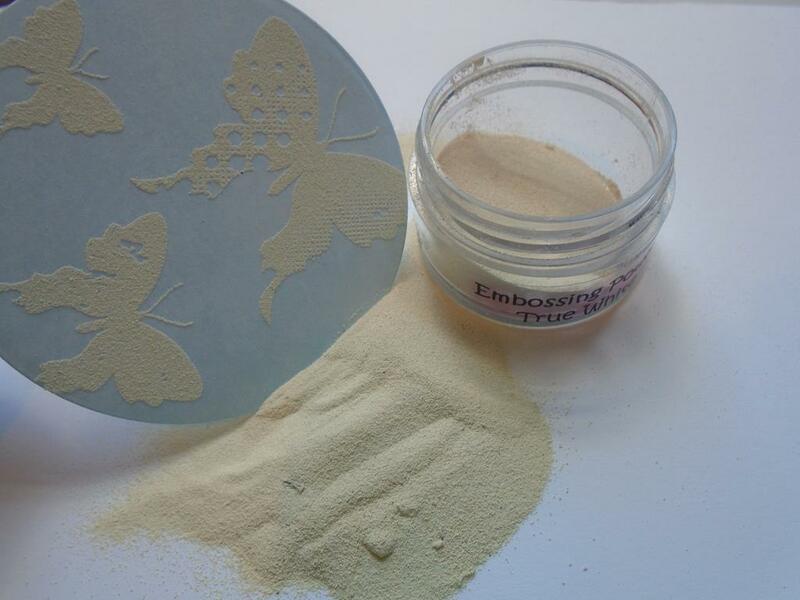 Pour the remaining powder back in the embossing pot and then heat set the powder using a heat tool. Step 31. 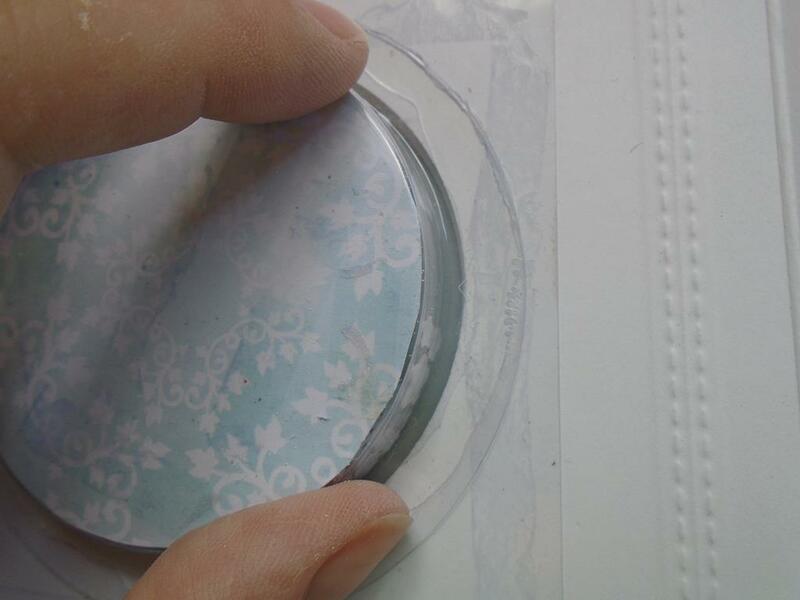 Hold the butterfly circle underneath the treat cup and the trim a small amount off the edge of the paper working around the circle as you cut. 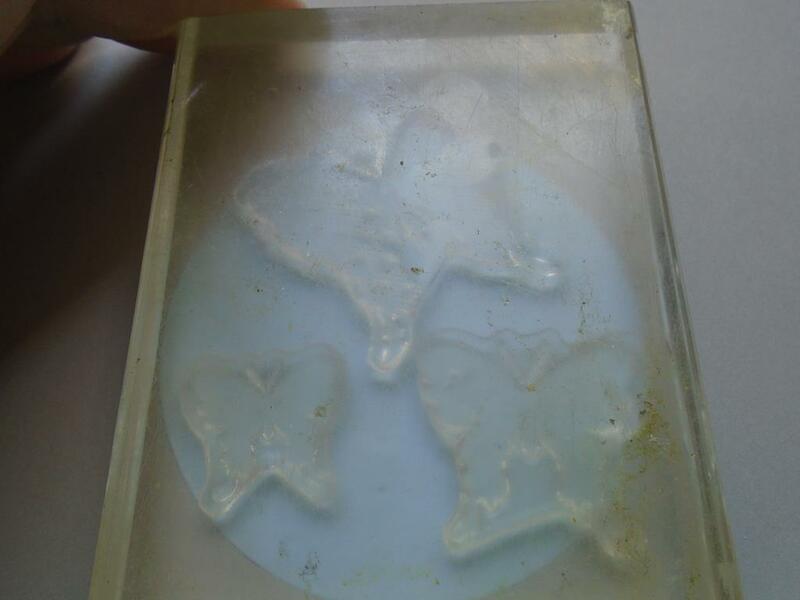 The inside of the treat cup is a bit smaller and the trimming is needed for the butterflies to fit inside. Use a die or punch is you have a slightly smaller once to make it easier. Step 32. 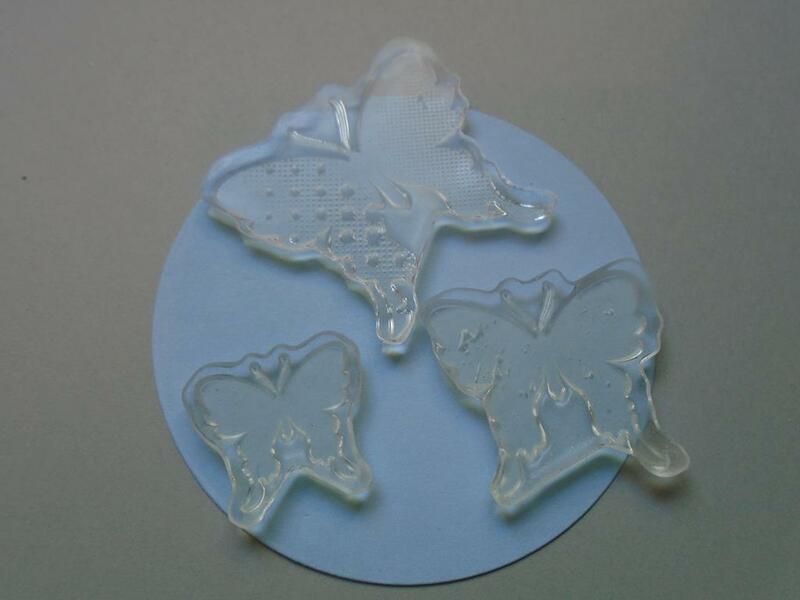 Stick the butterfly piece into the treat cup so the image is facing upwards. Step 33. 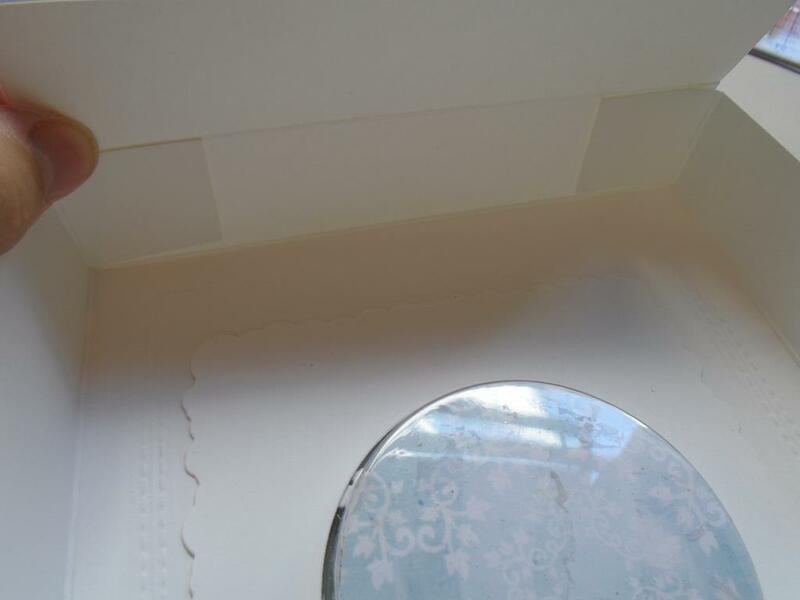 Here the treat cup is just held behind the card so you can see the sunken effect it will give later on. Step 34. Just lay the panel onto the card for a visual and this will be stuck down later on. Step 35. 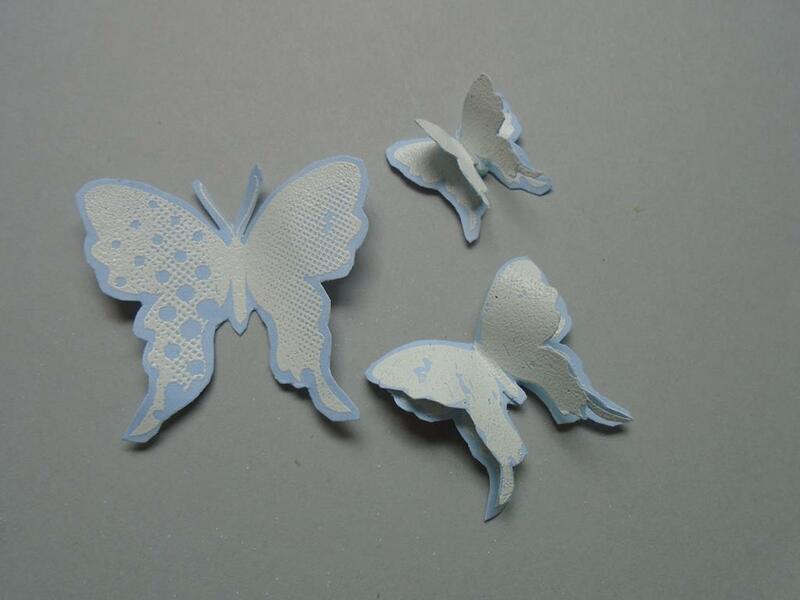 Stamp 3 of the butterfly splash stamps onto a piece of Foundations baby blue card and then emboss using the Cosmic Shimmer white embossing powder. Stamp another set if you want to decoupage 2 of the wings. Step 36. 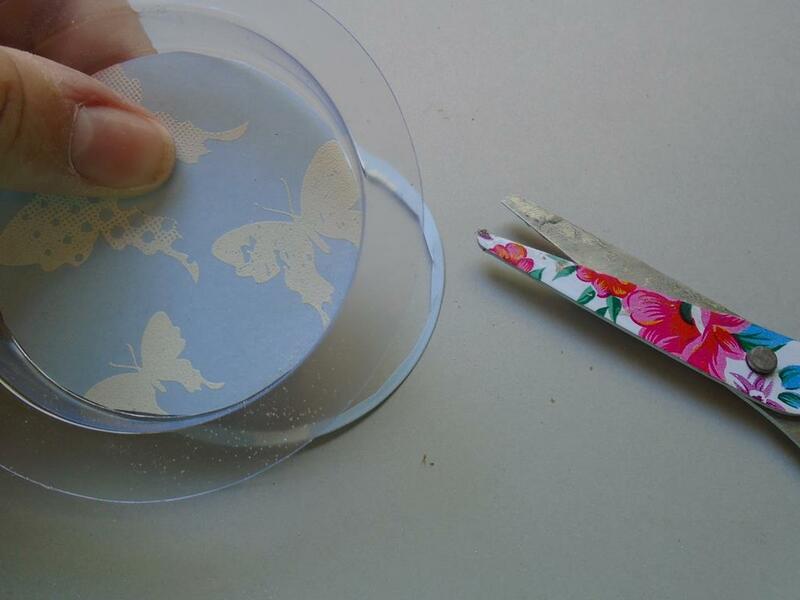 Trim the butterflies out leaving a small blue edge around the base butterflies and cut around the white edge of the top butterflies. 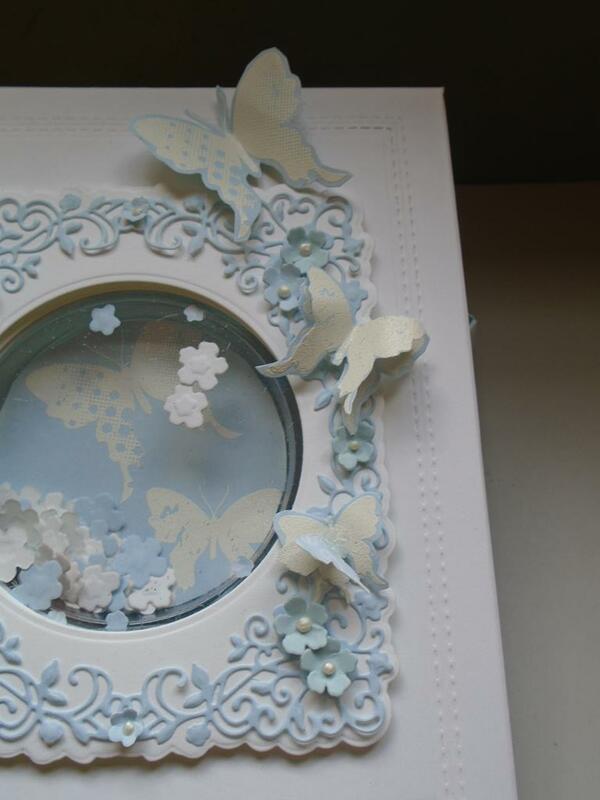 Curve the wings over to add shape and then add then to the base butterflies using a 3d glue. Step 37. 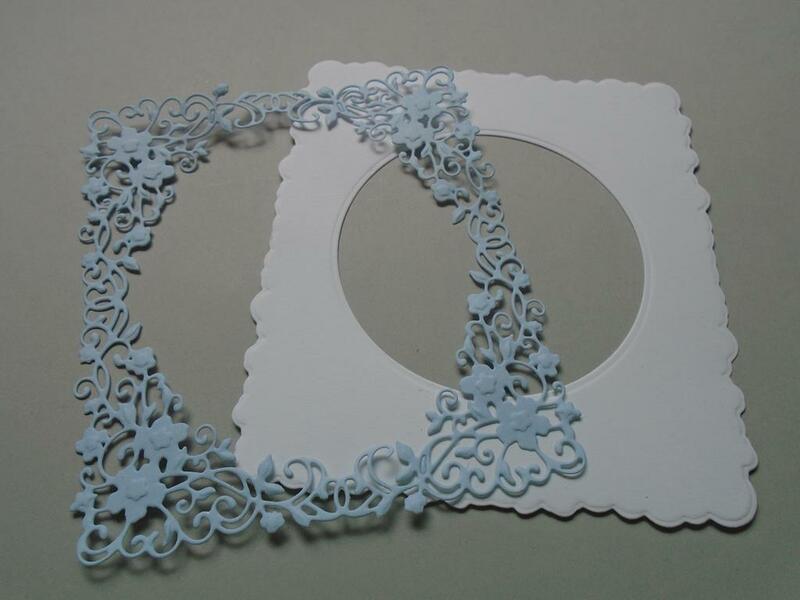 Cut and emboss some of the small flowers using the flower die from the delicate frame die set. Use coconut card and the baby blue card as well. Step 38. 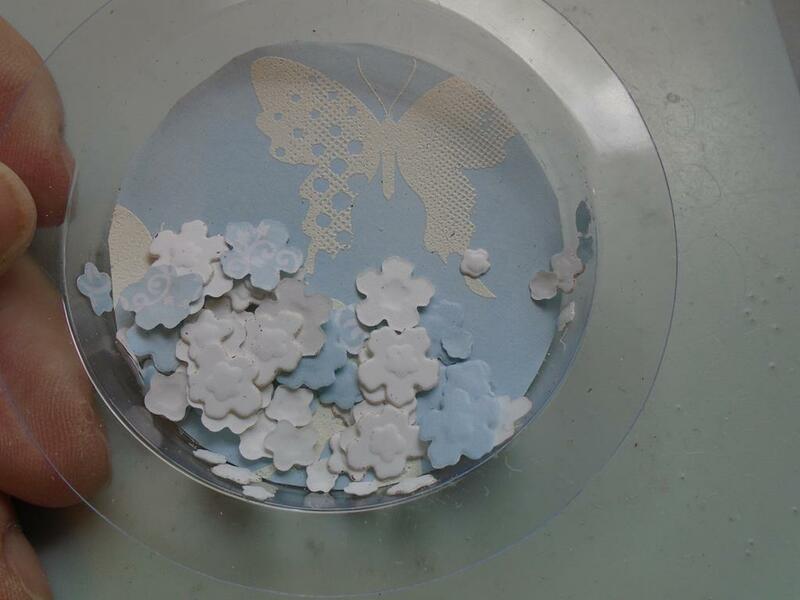 Place the flowers directly into the treat cut when building up the flowers. Step 39. 4 lots of the flowers should be enough but it`s up to you if you want more or less. Step 40. 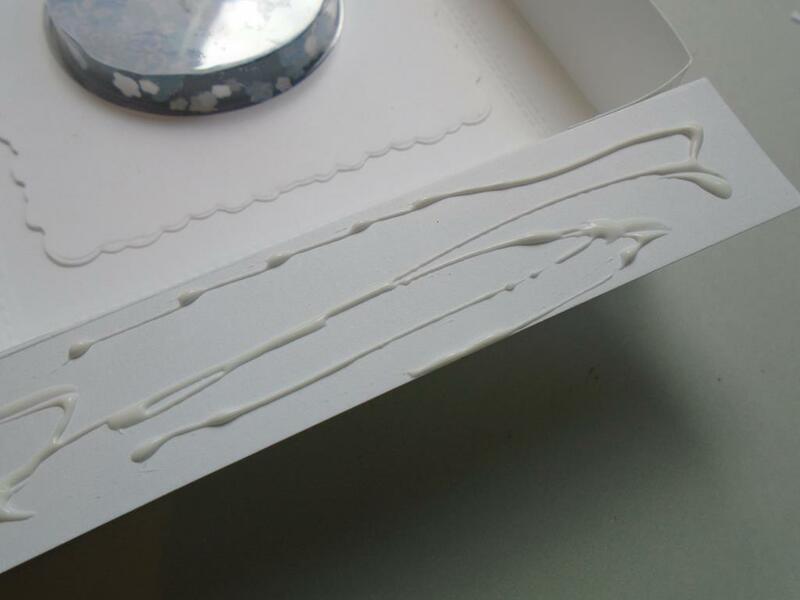 Add a line of 3d glue around the inside circle of the box lid. 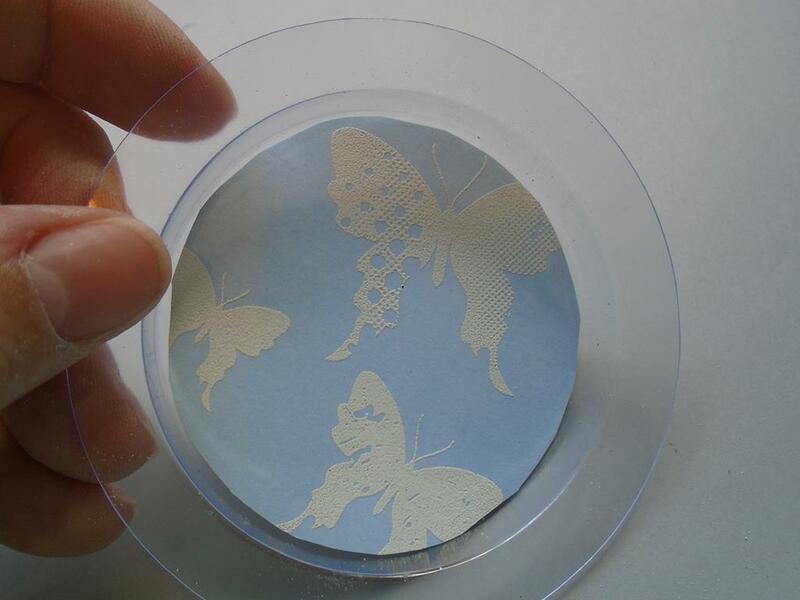 I find the 3d glue works best on the acetate and a treat cup. Step 41. 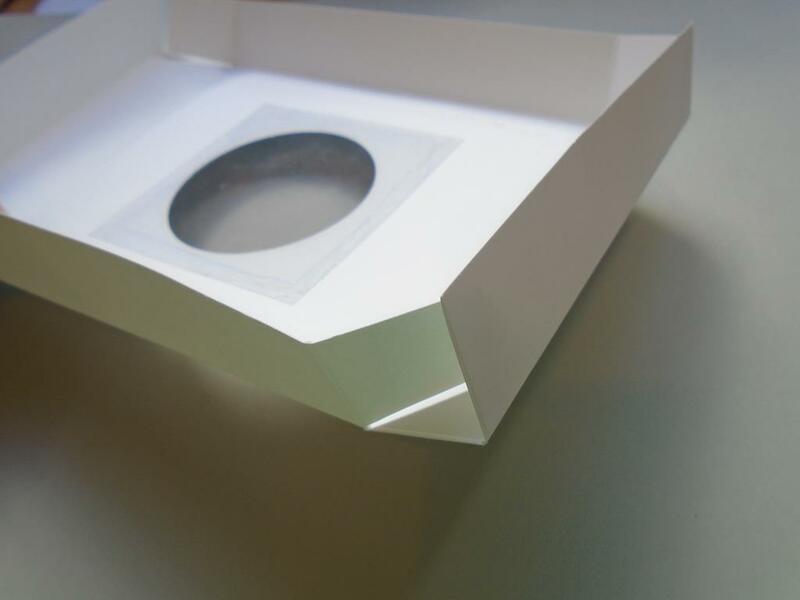 Press the treat cup onto the box lid lining up the aperture as you work. Step 42. 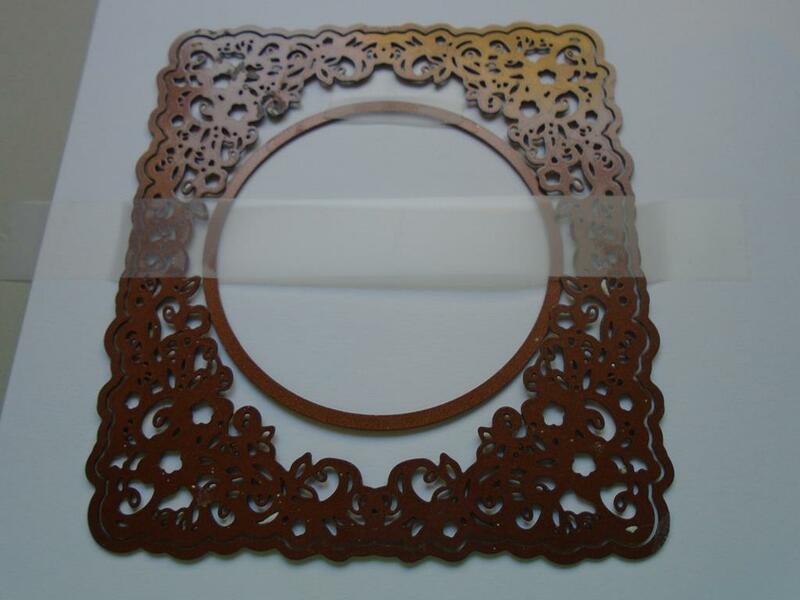 Stick the prepared garden frame panel onto the lid using foam pads for extra dimension. Step 43. Turn the lid over the ensure the treat cup is firmly stuck down. Step 44. 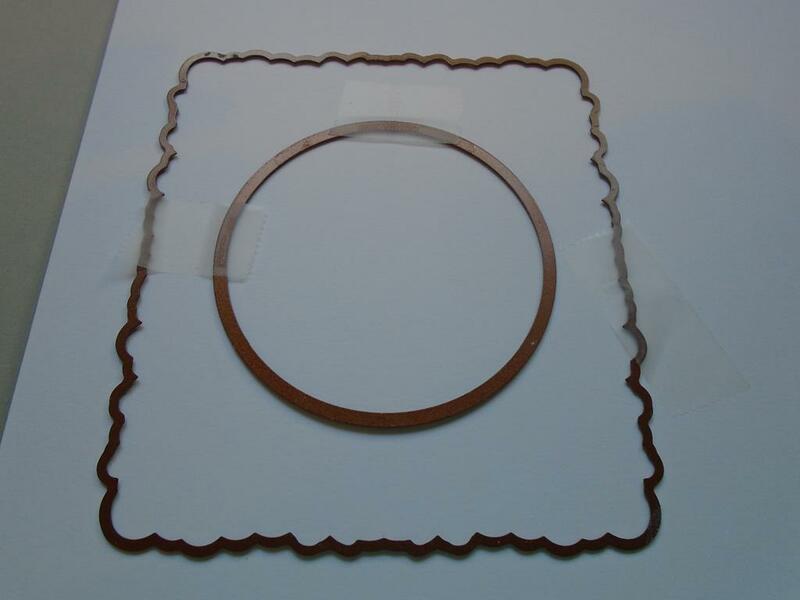 Cut another coconut solid panel using the outer delicate frame die and the circle die in the centre of the panel. Step 45. 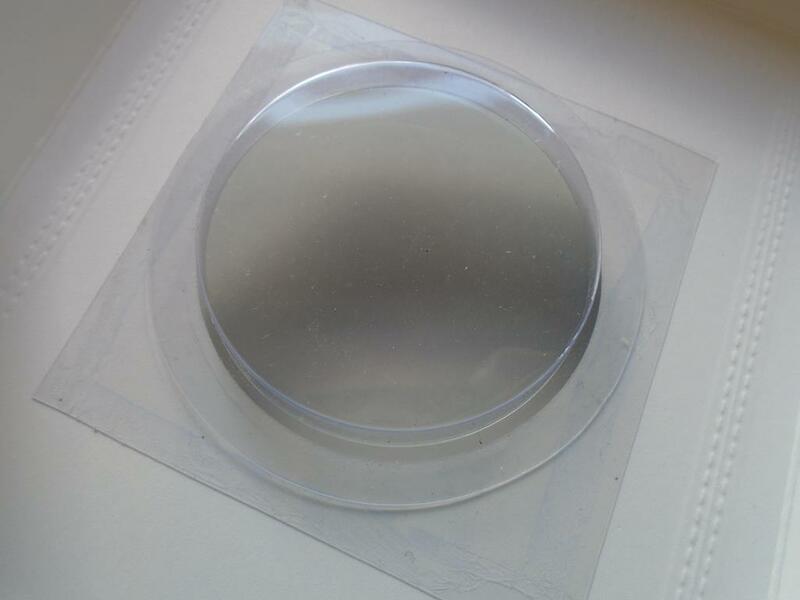 Stick this down so it covers the edges of the treat cup and acetate. Step 46. Now back to assembling the box lid. Here is photo how it was left with the creased folds although now the treat cup etc has been added in. Step 47. 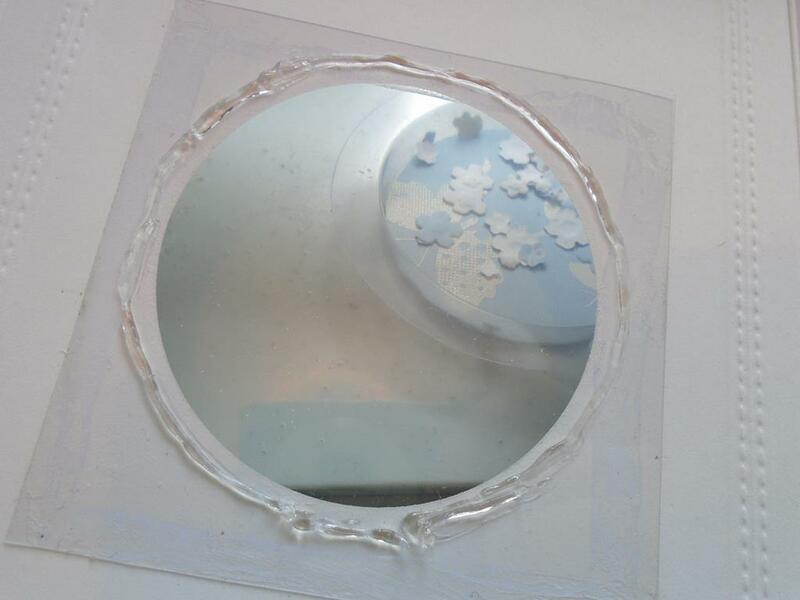 Add some of the Cosmic Shimmer dries glue on each of the corner tabs making sure you don`t add to much glue that it spills over the edges of the flaps once they are in place. Step 48. Bring the glue tab up and place it on the inside of the 2nd scored box panel leaving the outer scored box panel clear as this will be folded down later to cover the tab up. 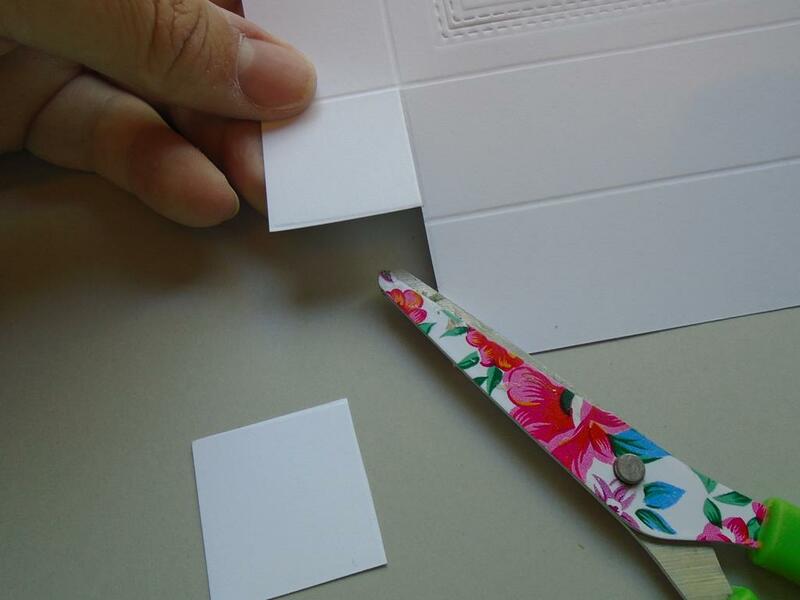 PLEASE MAKE SURE you square the tabs up neatly on the corner of the card as it will give the finished box a neater finish. Repeat this on all of the tabs holding each tabs for a few seconds whilst the glue takes (wiggle the glue / card a little as this helps to activate the glue). Step 49. You will be left with 2 flaps which you can now add some Cosmic Shimmer dries clear glue on the inside of the tabs at either end. Step 50. 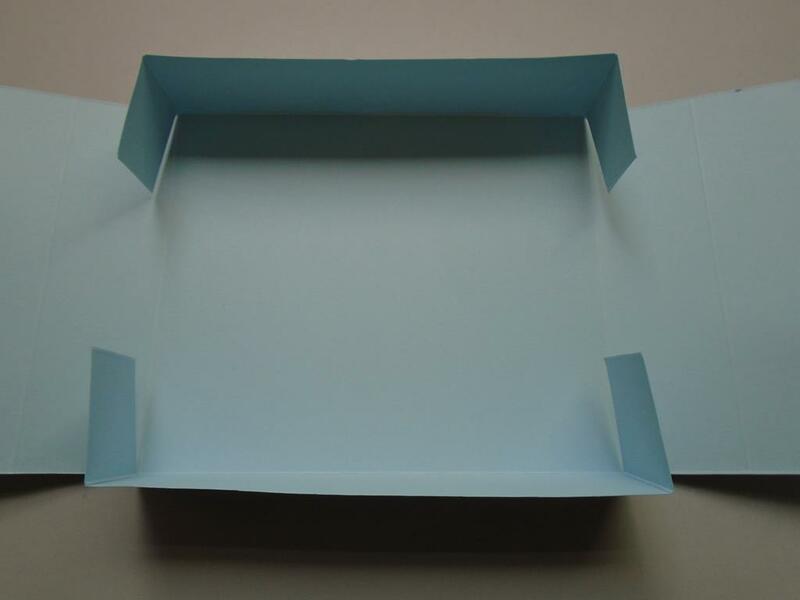 Fold the tab over the box side so it covers the corner tabs. Step 51. 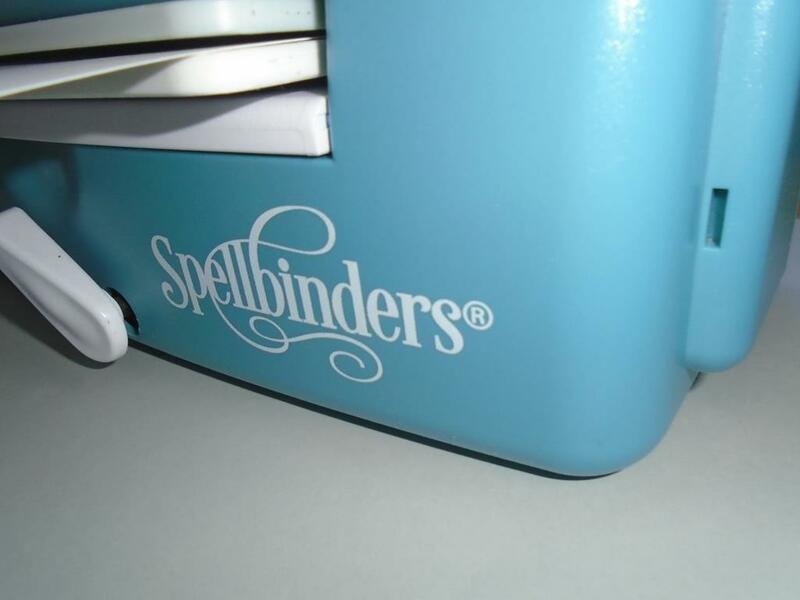 Now you will have a lovely sunken shaker panel in the lid of your box !!! Something different and it will catch the eye of the recipient i`m sure. Step 52. To make the base take a piece of A3 card and score down the side edge in a landscape position at 4cm and then 8cms then measure and score 174mms away from the 8cm measurement and then score a 4cms and another 4cms after the large measurement to make the 2 end folded panels. 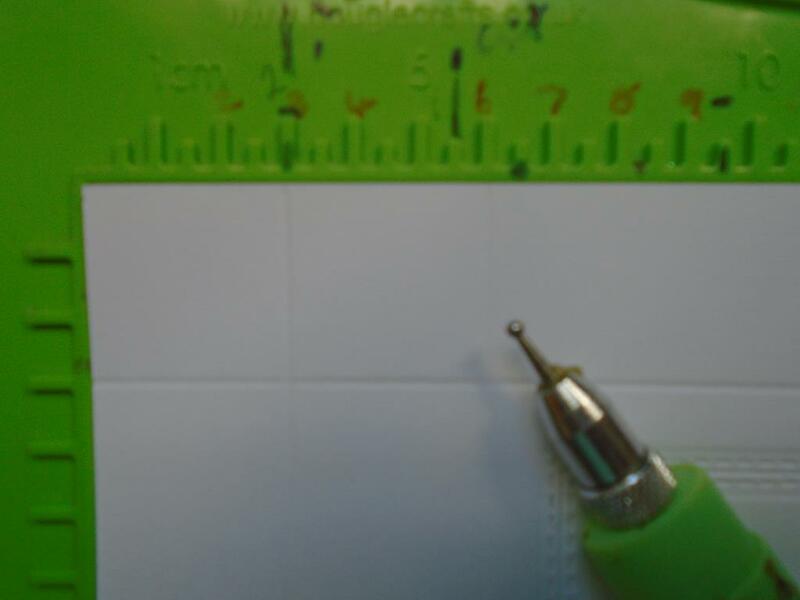 Turn the card and score at 4cms and measure and score 146mm after the 4cms and then measure and score another 4cm tab. 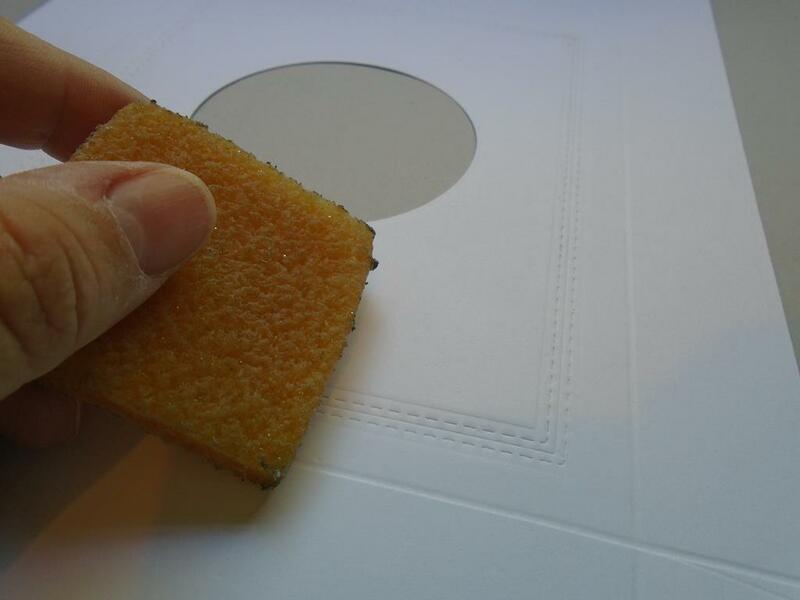 Trim away the excess card after the final measurements. Step 53. 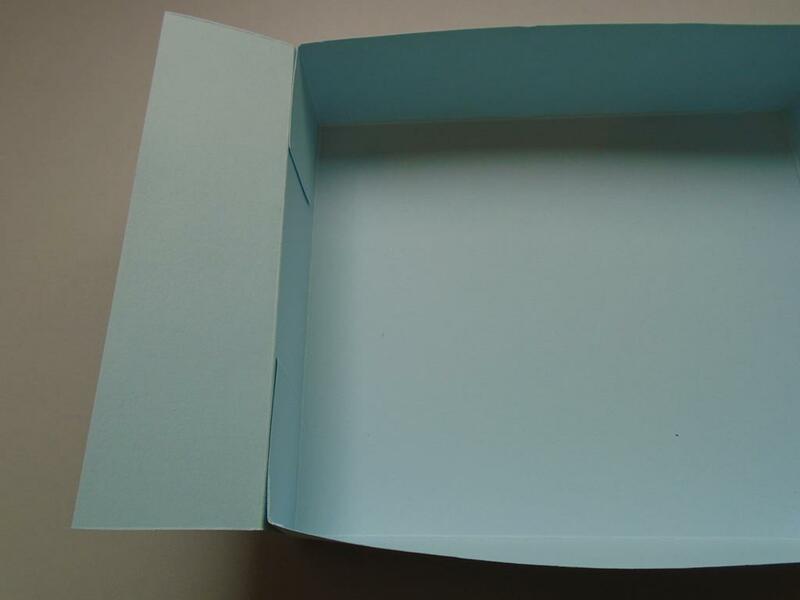 Repeat the process as you did in the lid to make the tabbed box base shape. 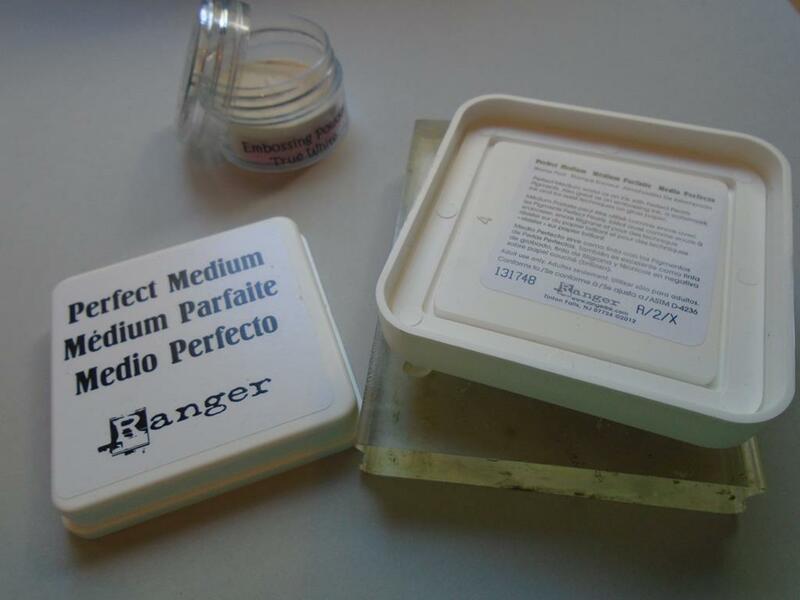 The above measurements sound a bit complicated but it`s just a 4cm depth box instead of a 3cm depth as in the lid and then the finished lid measured 178mm x 150mm so 4mms was taken off this lid size to make a 174mm x 146mm base with 4cm depth of the box. Step 54. Crease and then turn the corner tabs in. Step 55. Fold the outer 4cm end panels back down so they are out of the way. Step 56. 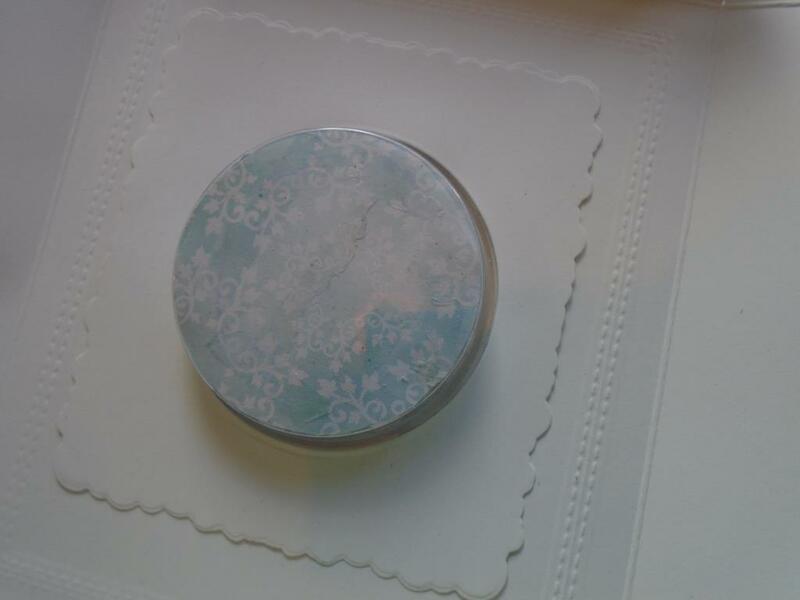 Use the Cosmic Shimmer dries clear glue to attach the tabs to the inside of the box. Step 57. 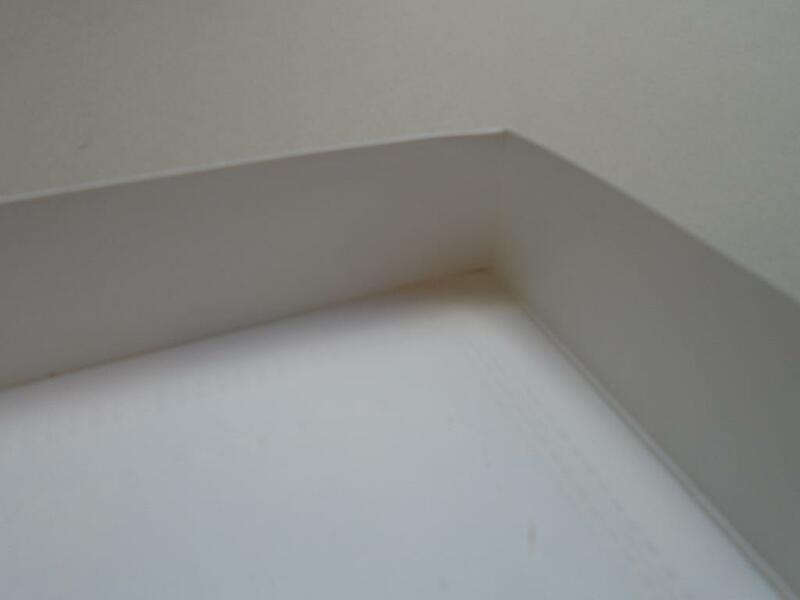 Glue and then fold down the outer flaps to cover the tabbed corners and to strengthen the box. Step 58. 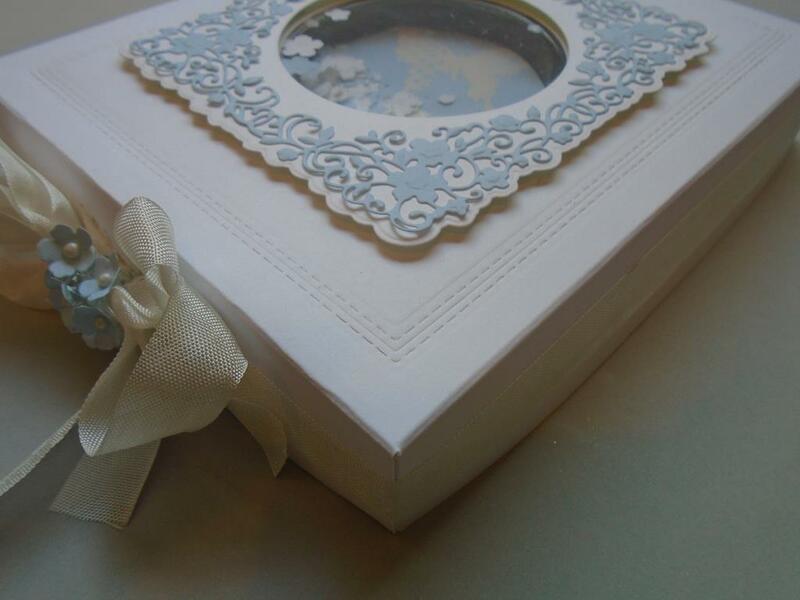 Attach a vintage ribbon and bow around the rim of the lid of the box. Step 59. 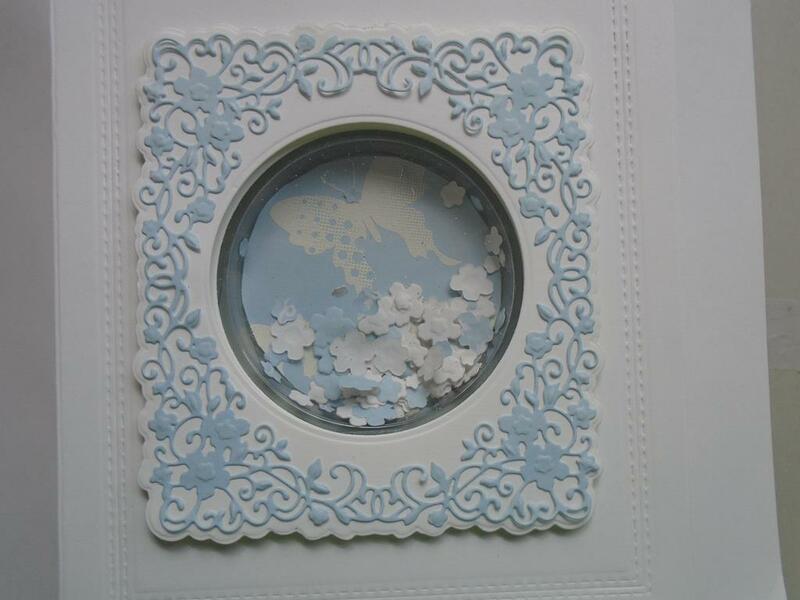 Cut and emboss some more of the small flowers from the delicate frame die set in the Foundations baby blue card for a contrast in the blues. Step 60. 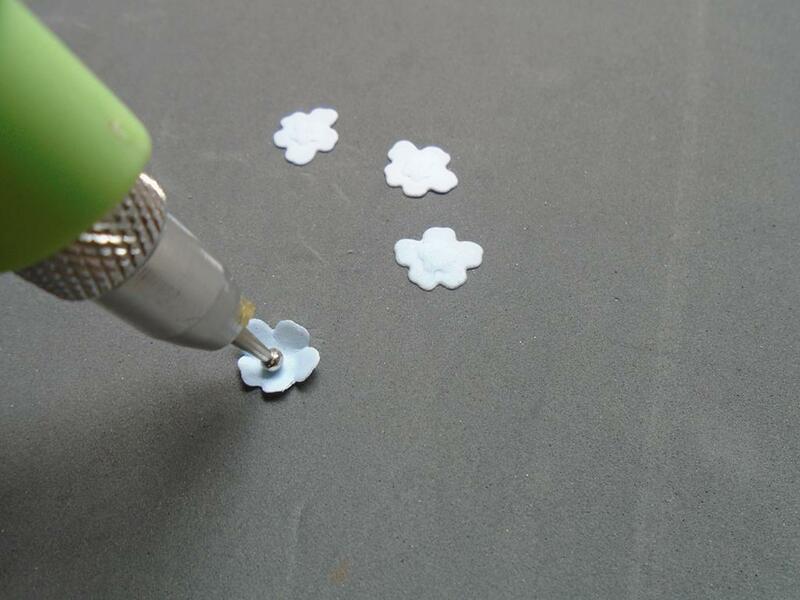 Use a ball tool on the Creative Expressions stamp mat to shape the flowers. Step 61. 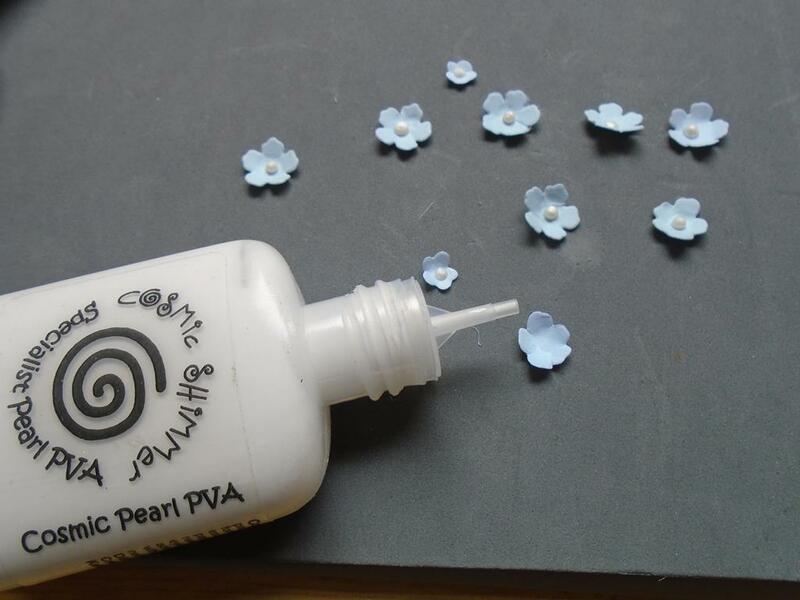 Add a small faux pearl using a drop of the Cosmic Shimmer pearl PVA glue in the centre of the flowers and set aside to dry. Step 62. 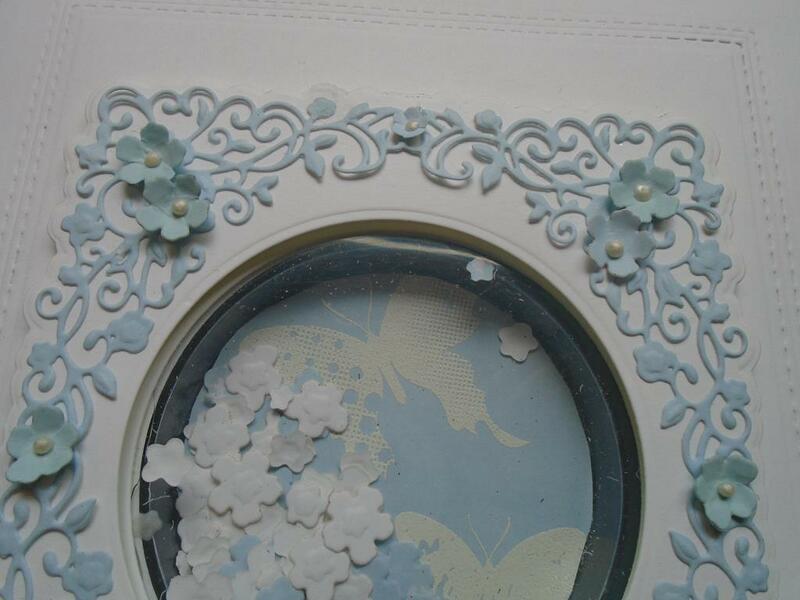 Attach the flowers to corners of the delicate frame for added detail. Step 63. Also add some 3d glue over the knot of the bow and then add some more of the pearl flowers to create a hydrangea effect to the ribbon knot. Step 64. Add the 3 butterflies down the corner of the frame in descending order. Step 65. Here is the finished project. Step 66. 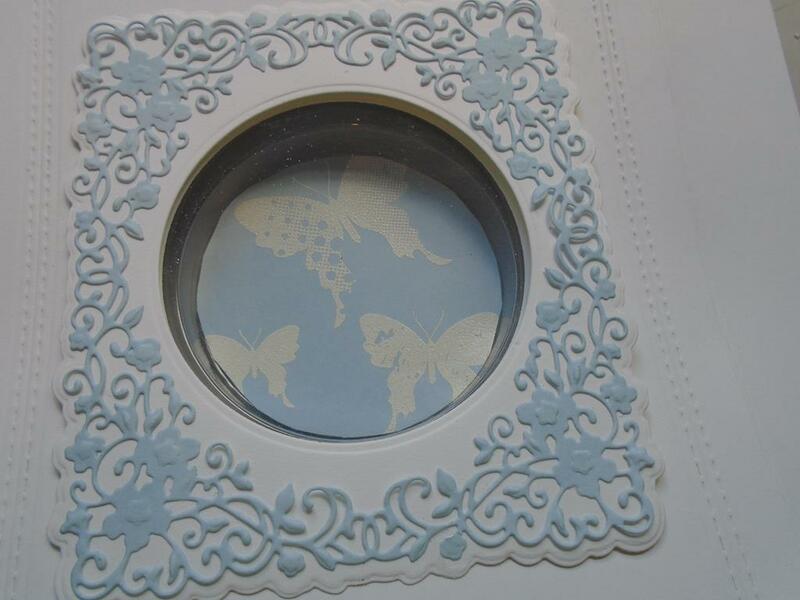 This photo shows the depth created by the treat cup and the lift of the frame and butterflies. Step 67. 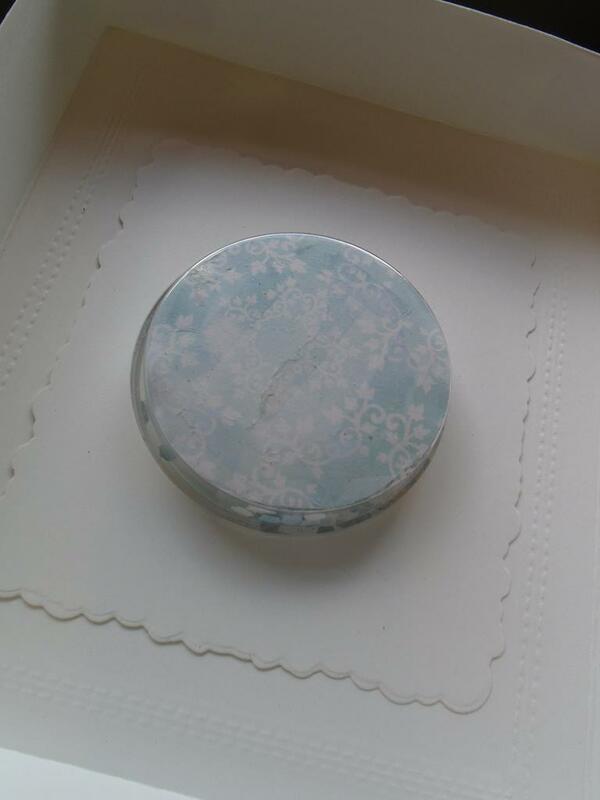 The reverse of the lid is neatly finished and the treat cup sits perfectly inside the lid. Step 68. 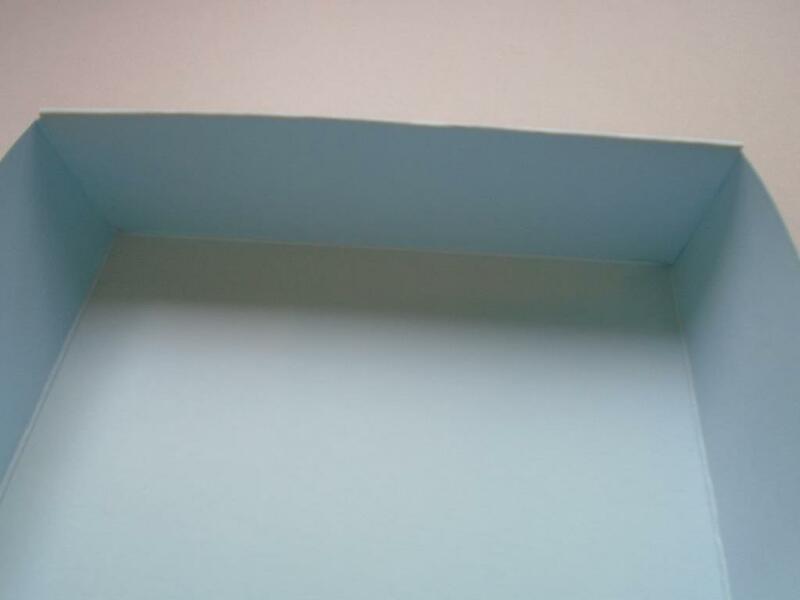 A soft effect often gives those details needed in a project. Step 69. 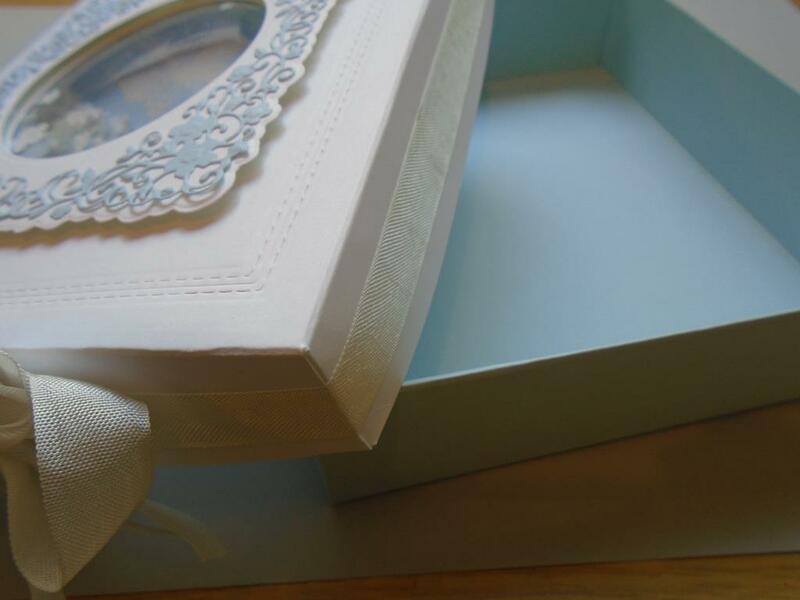 This photo shows the box can be used to add a gift and the Wedgewood inspired card that was made in another workshop can be given as the matching card.